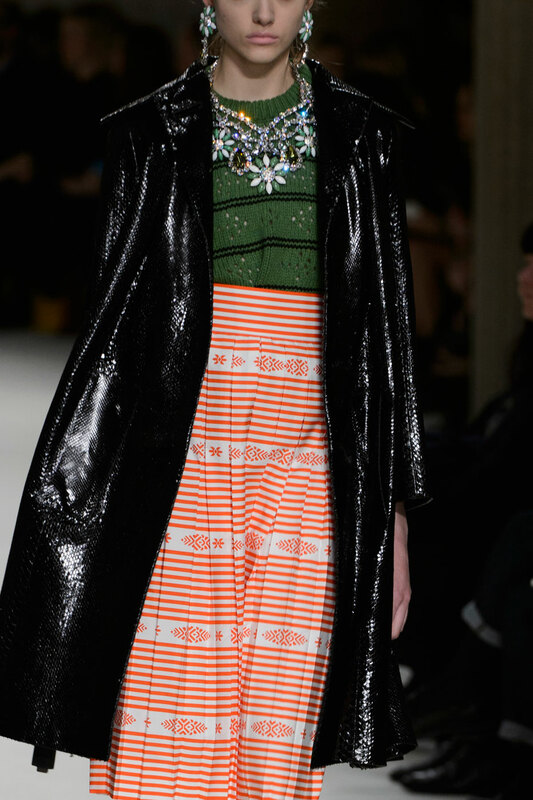 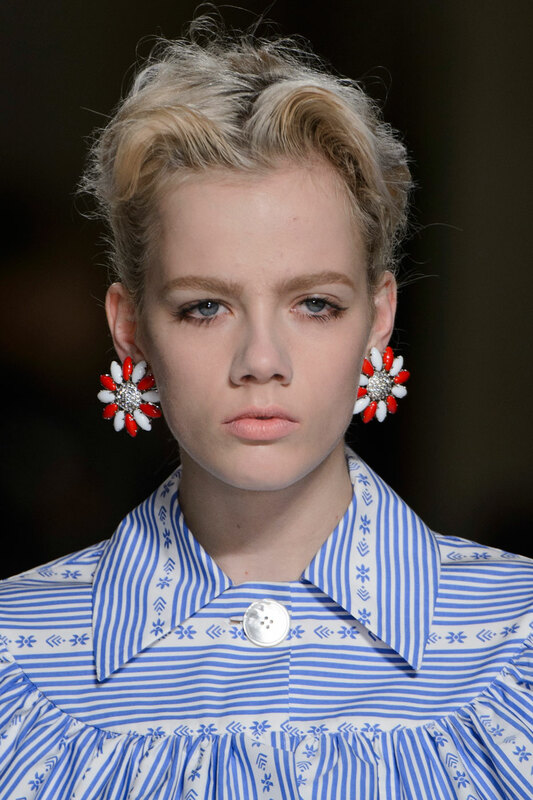 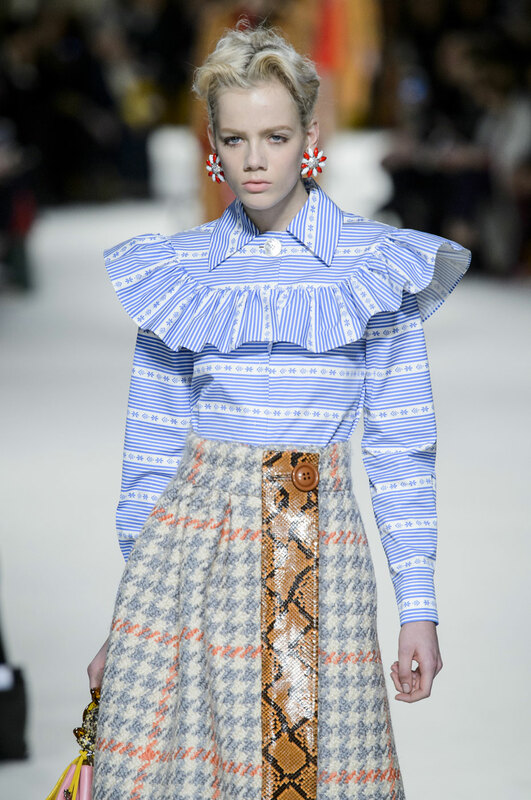 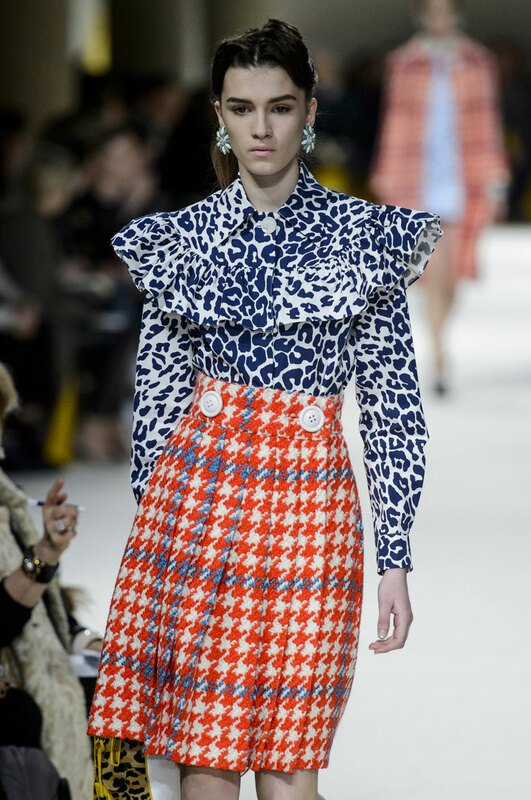 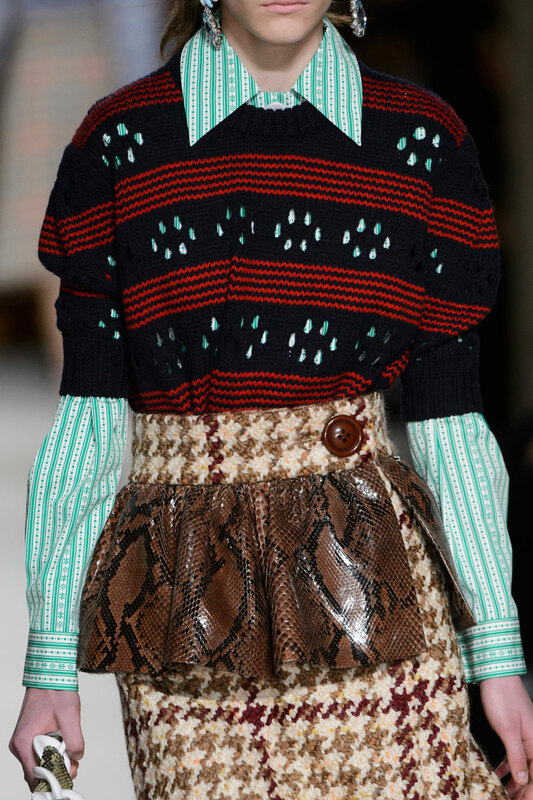 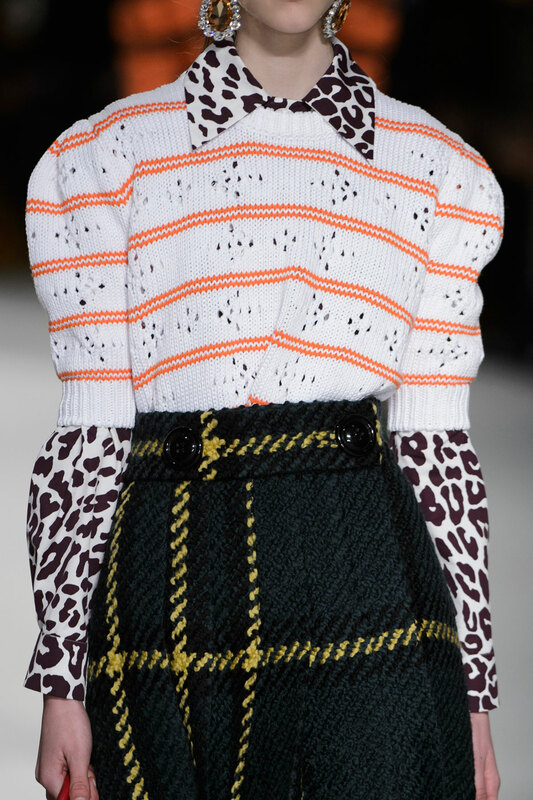 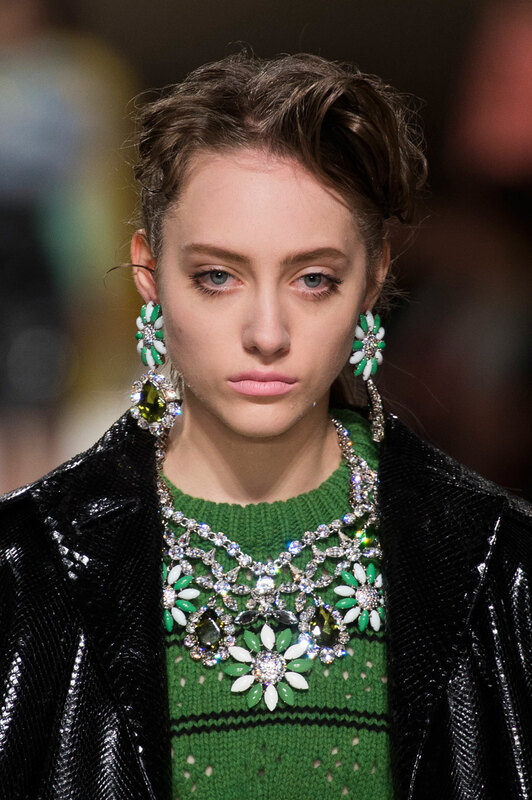 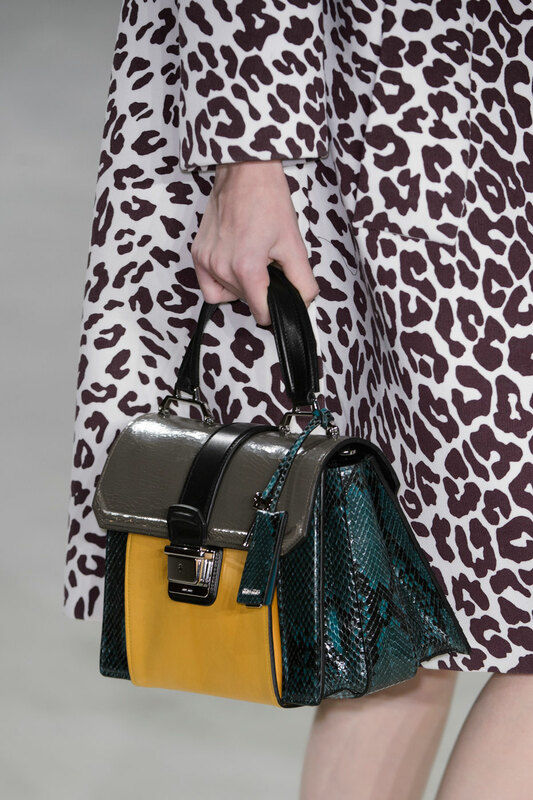 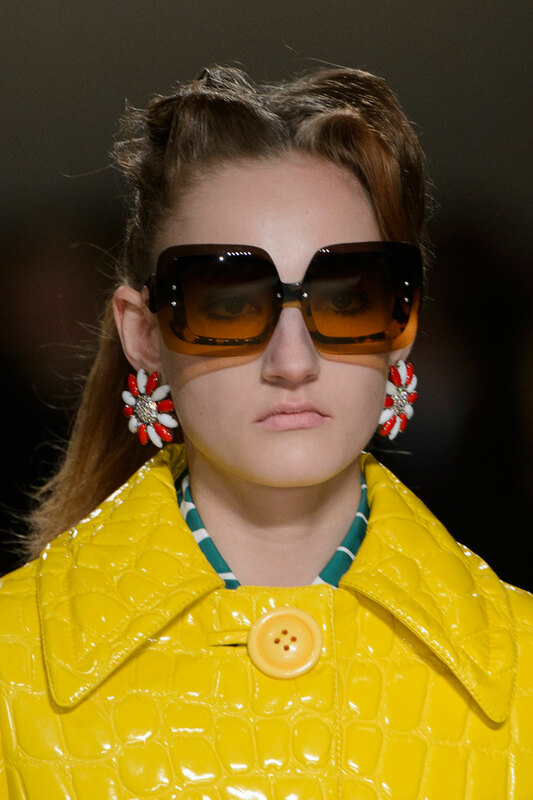 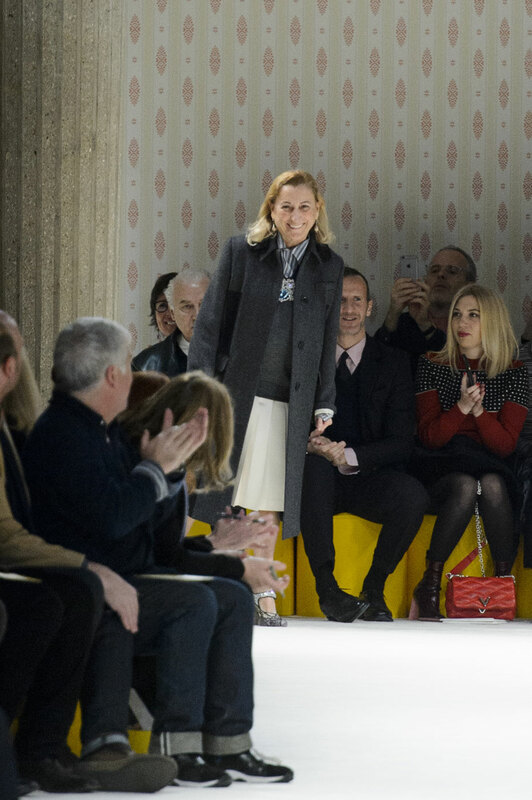 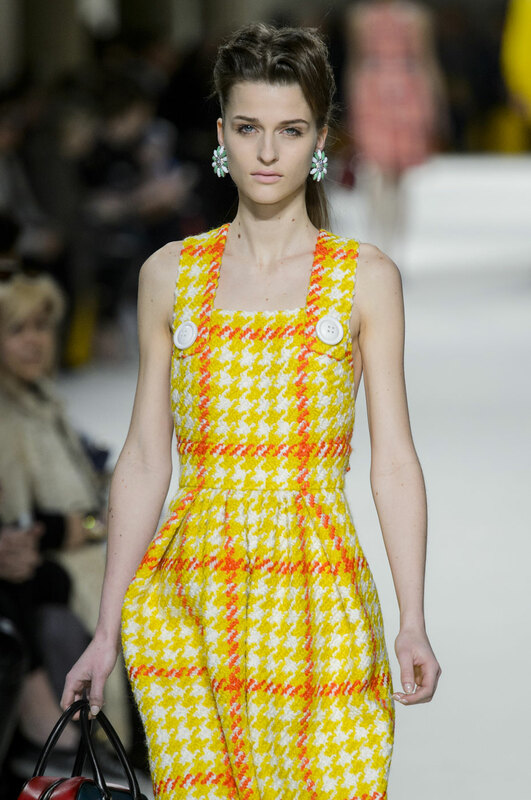 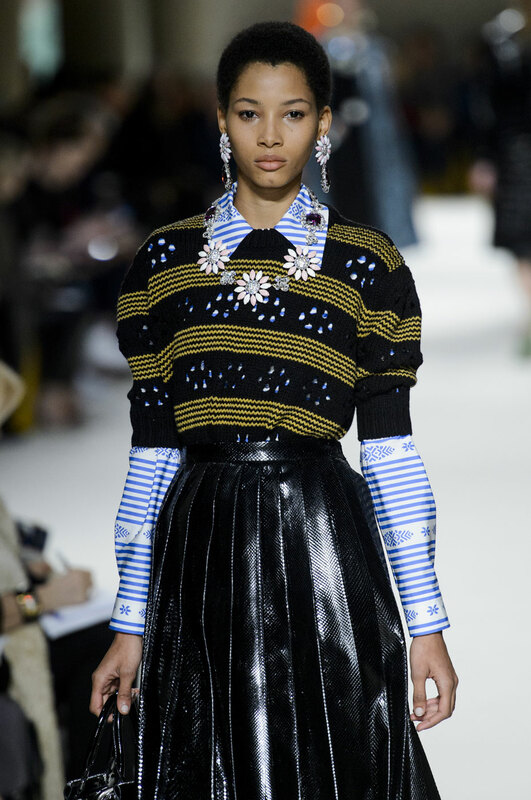 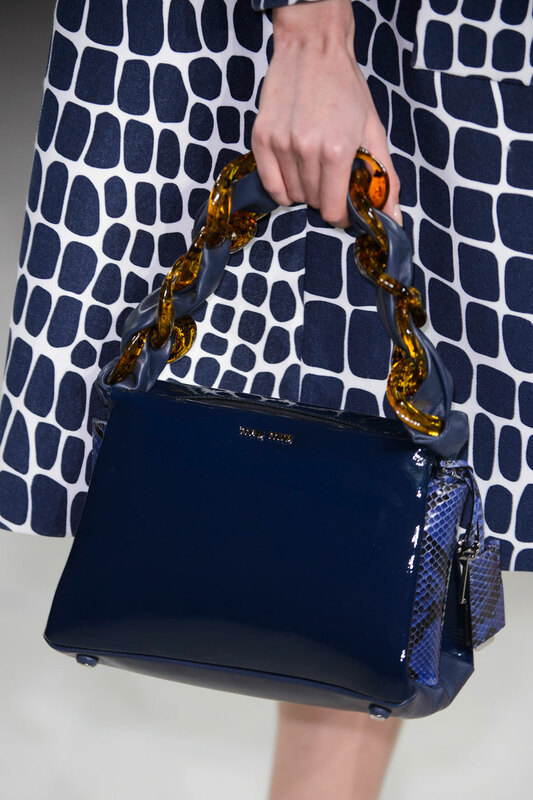 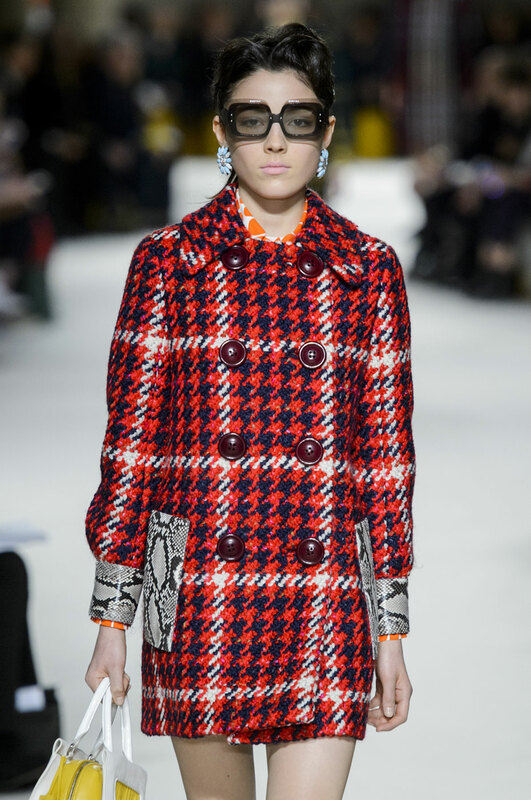 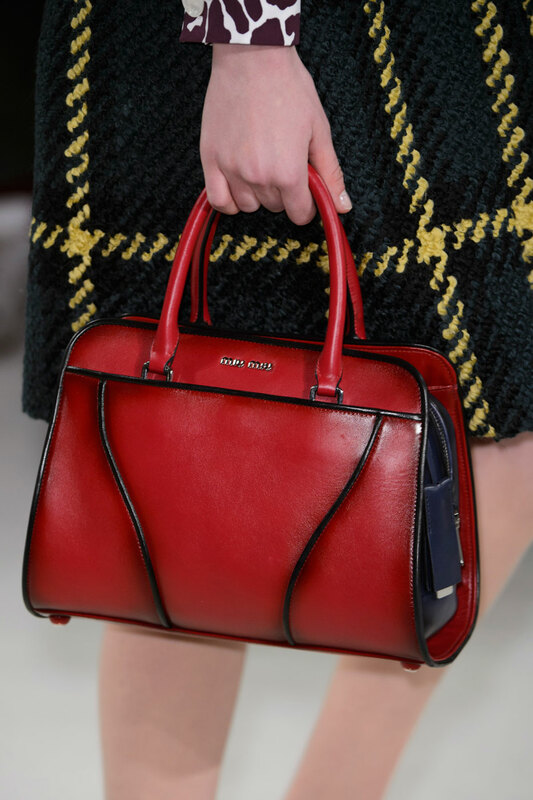 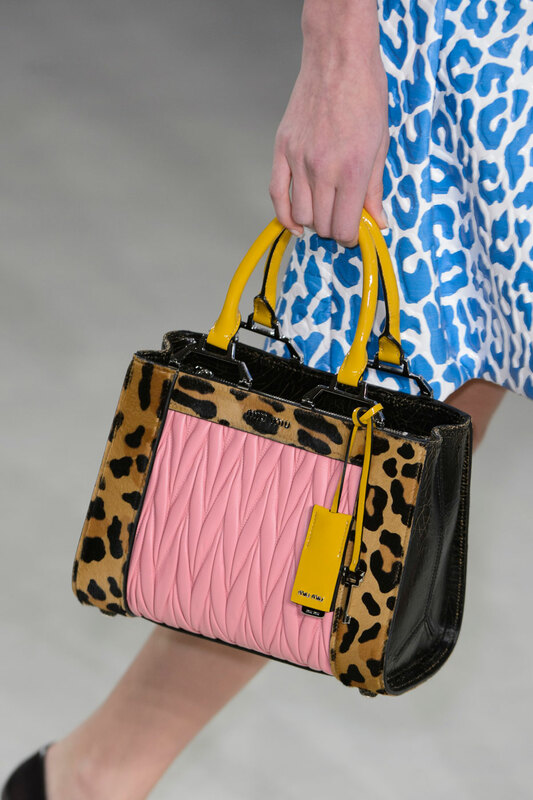 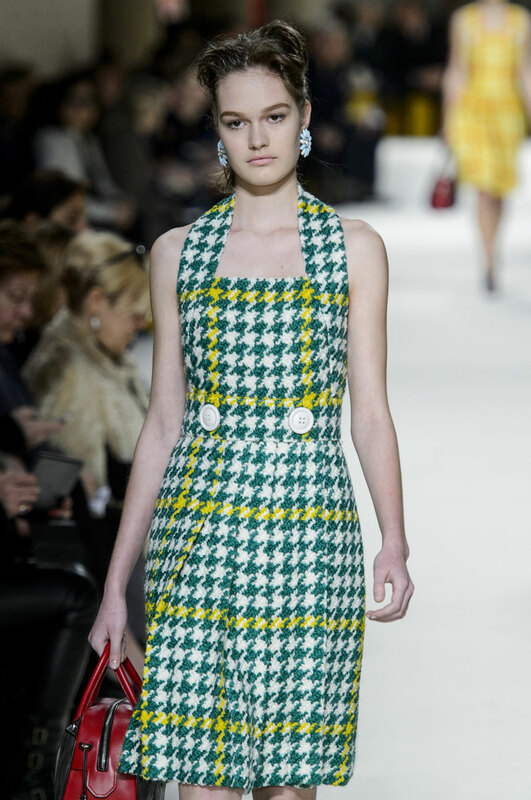 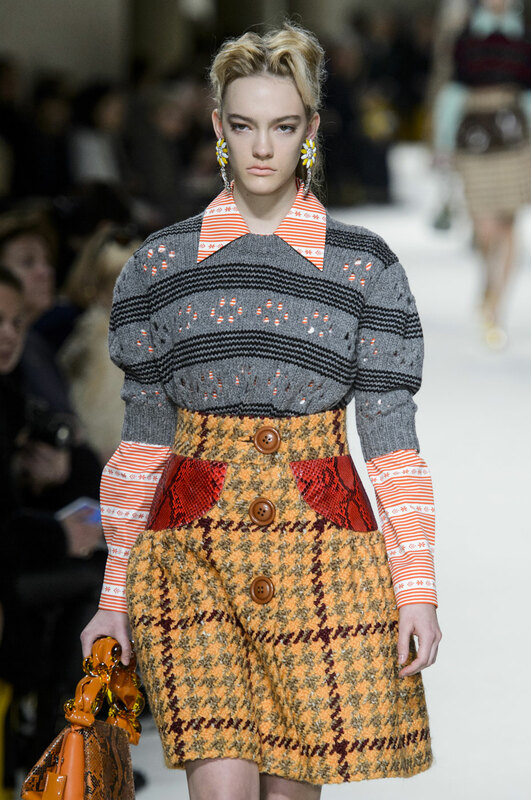 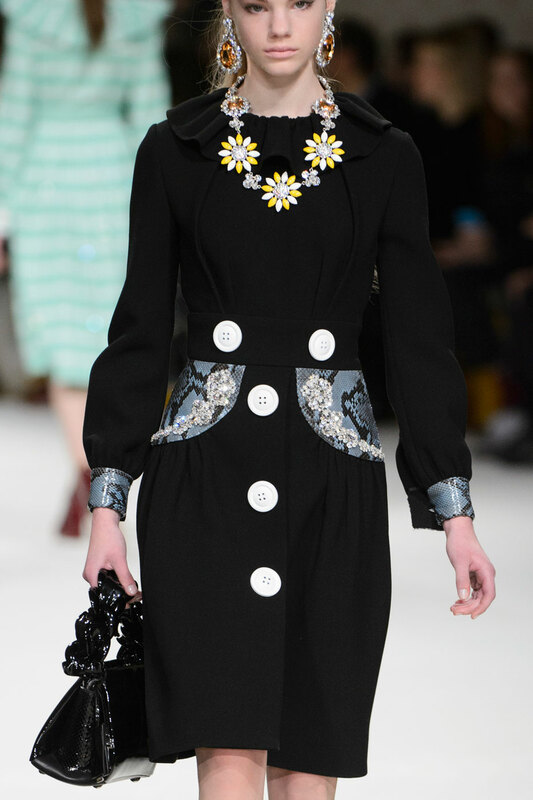 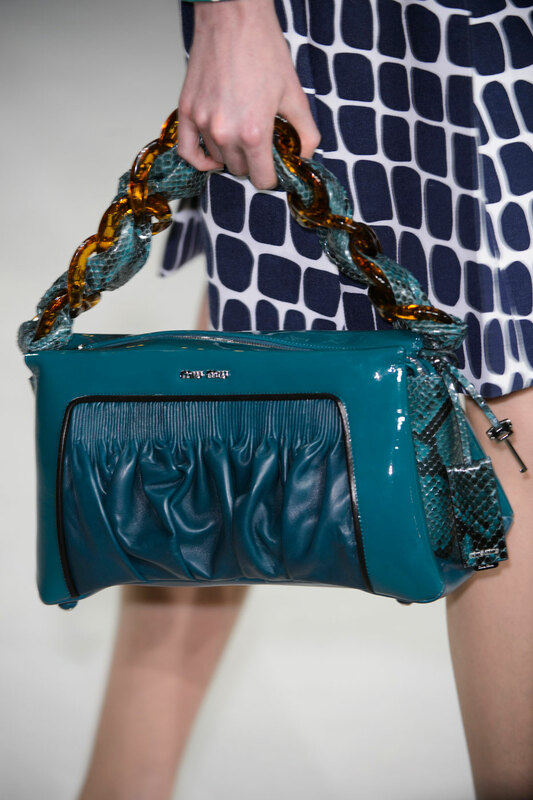 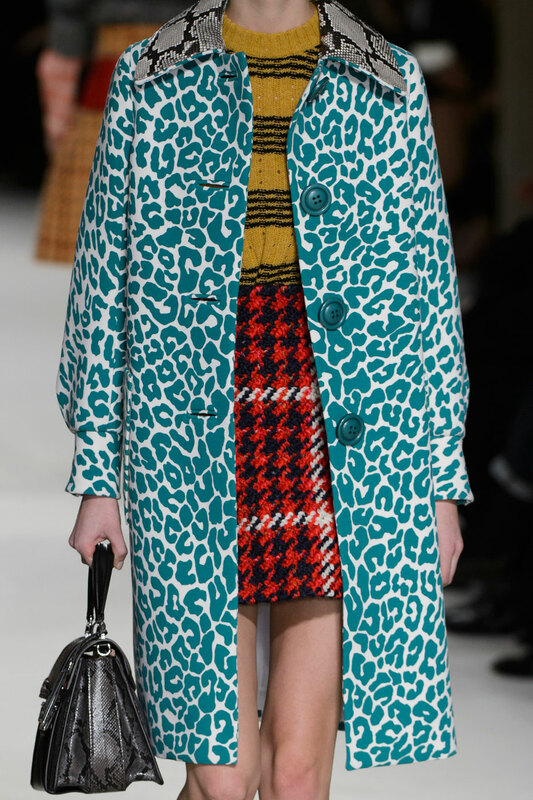 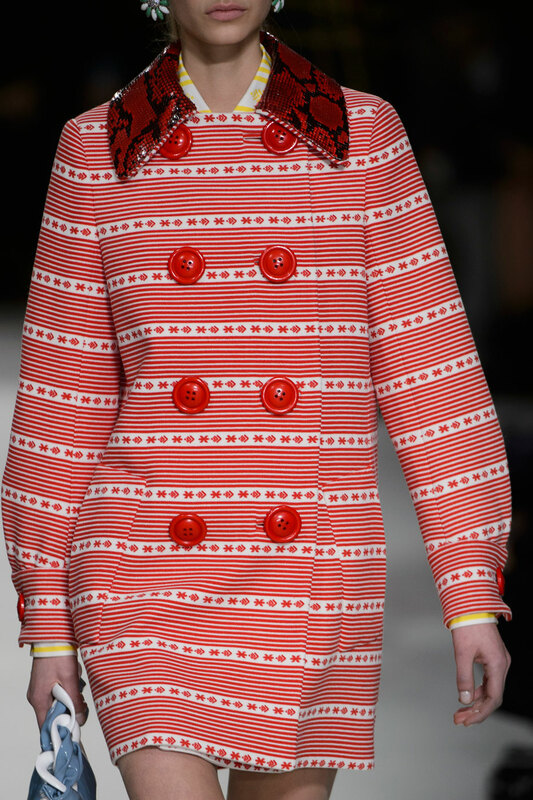 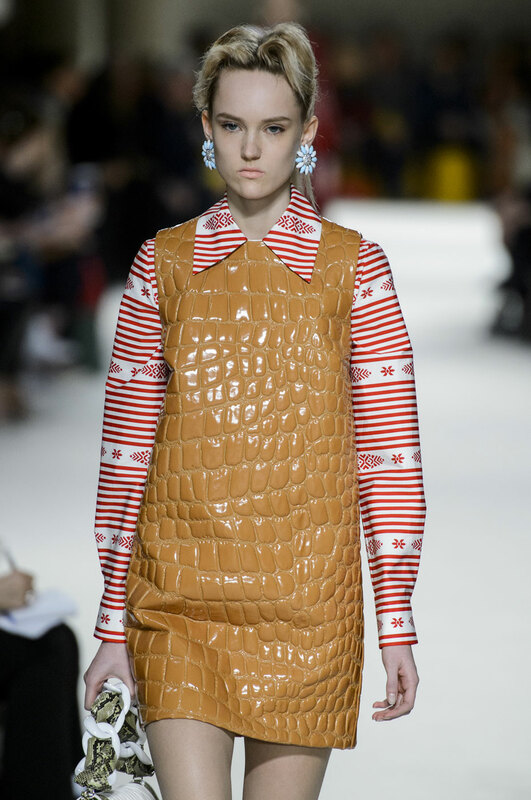 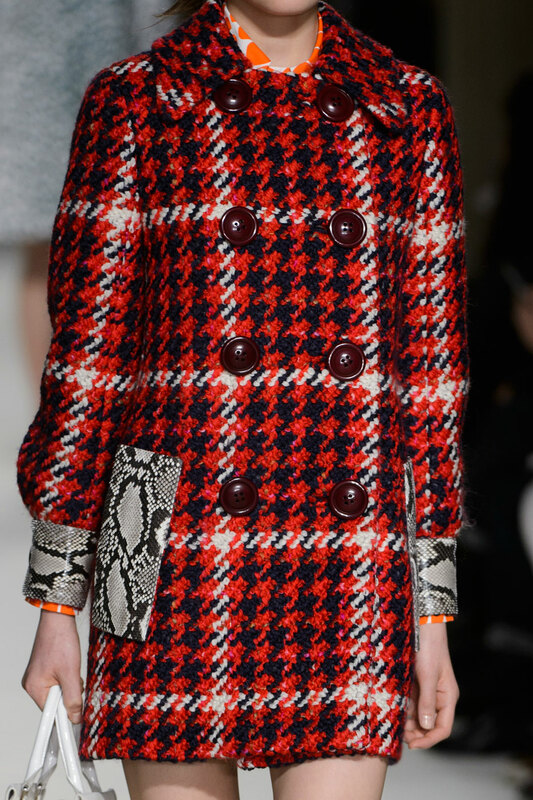 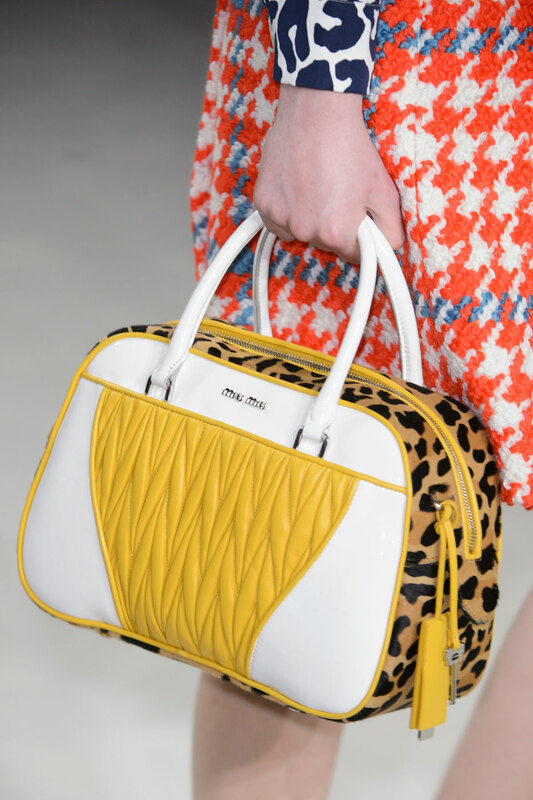 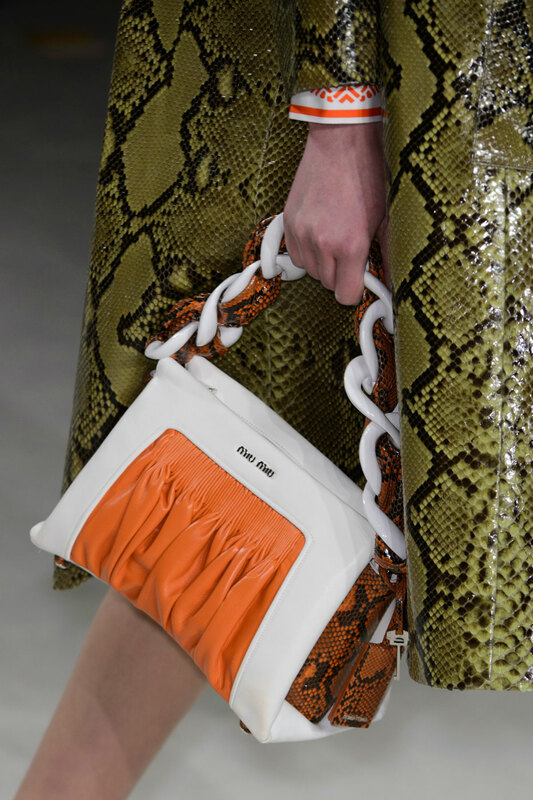 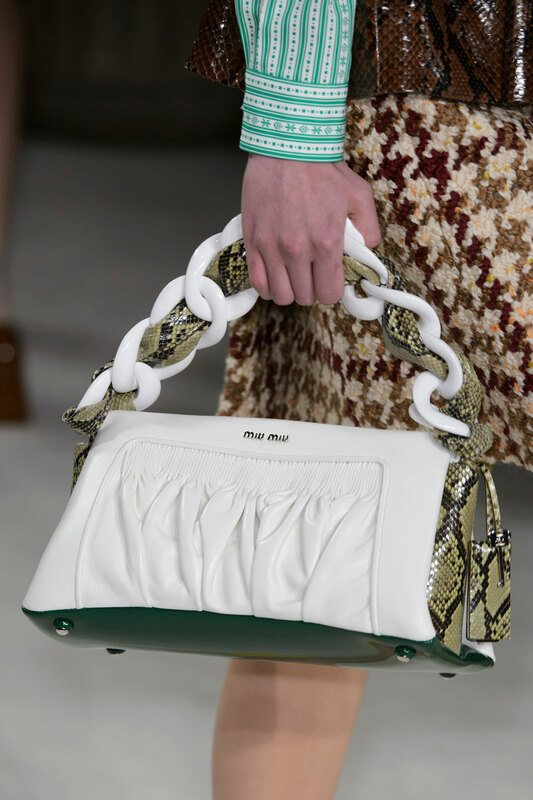 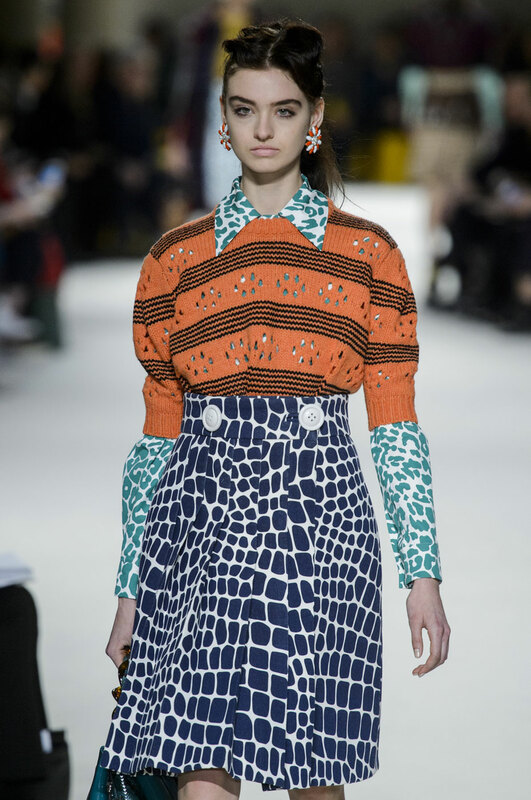 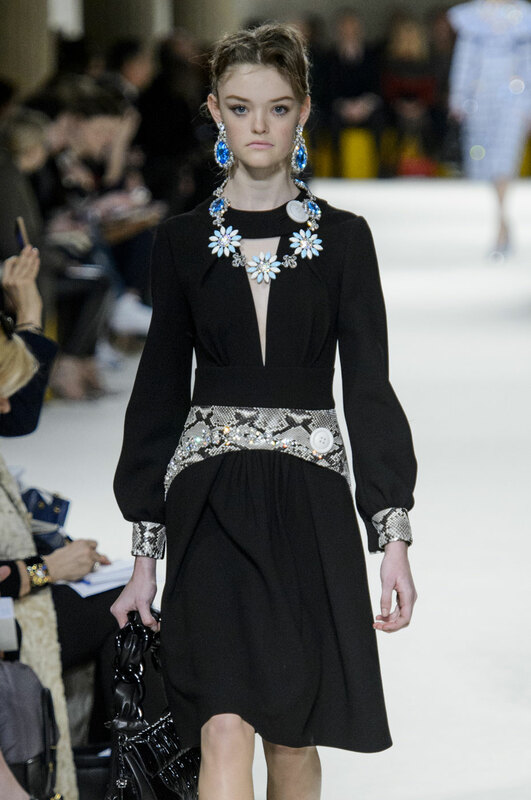 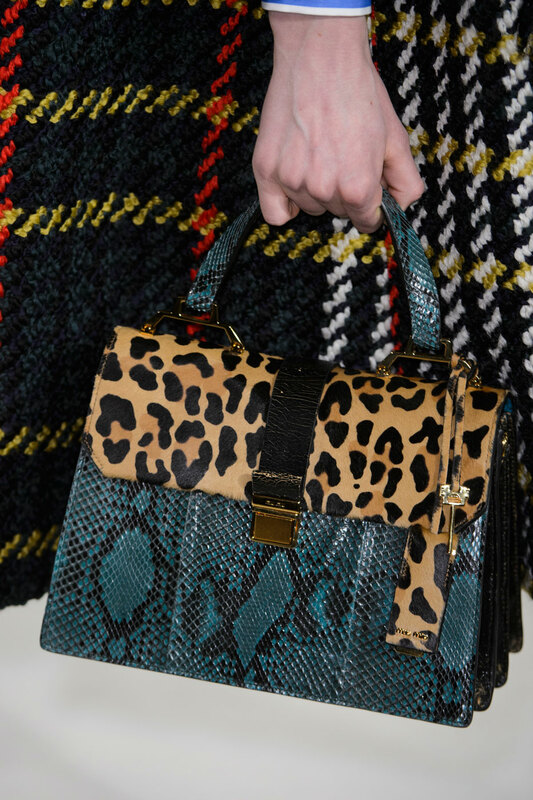 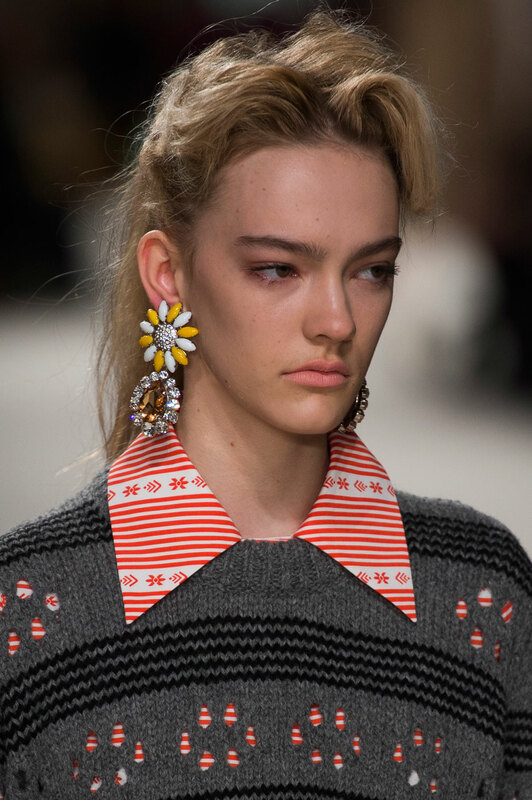 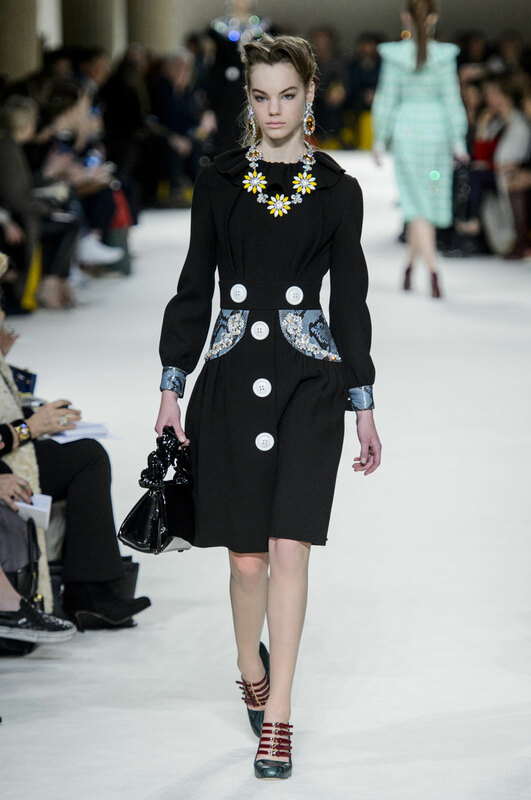 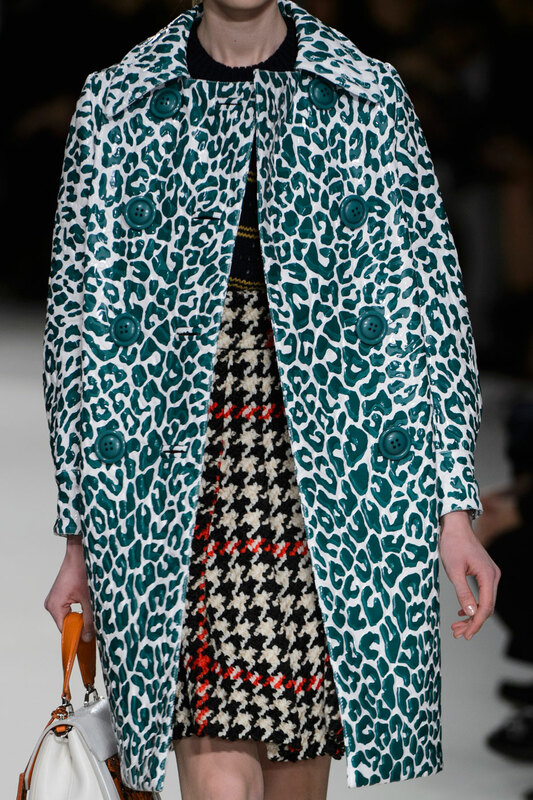 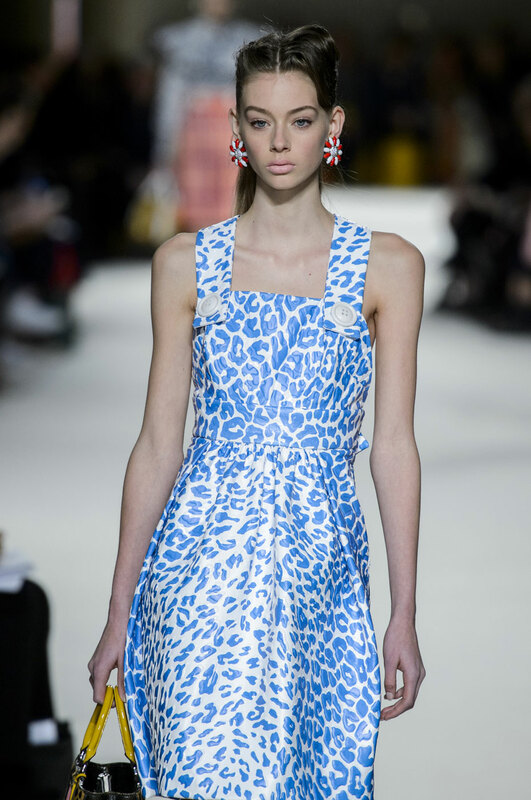 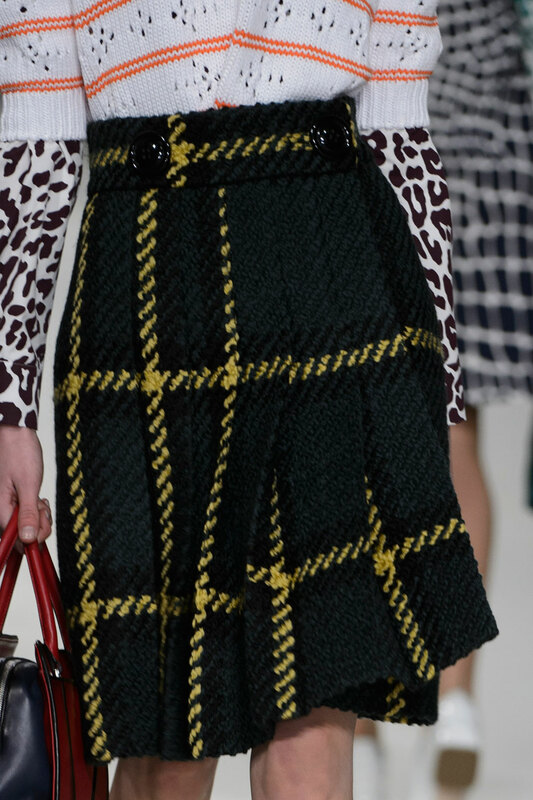 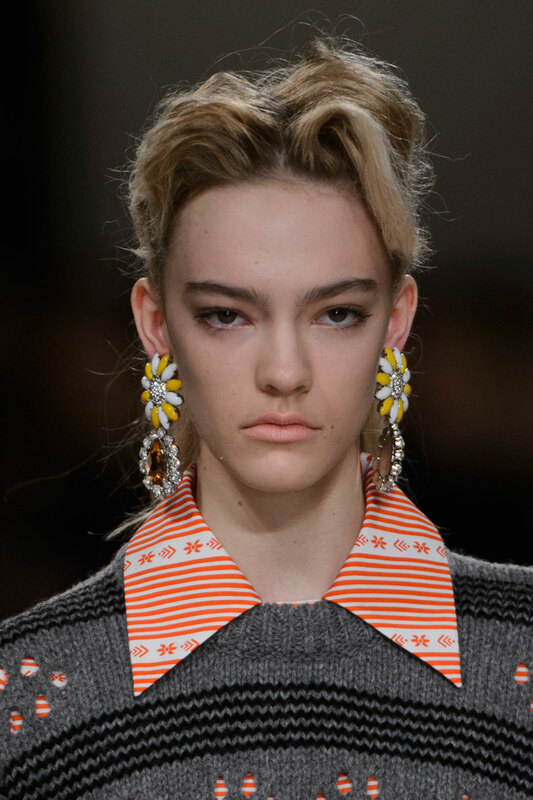 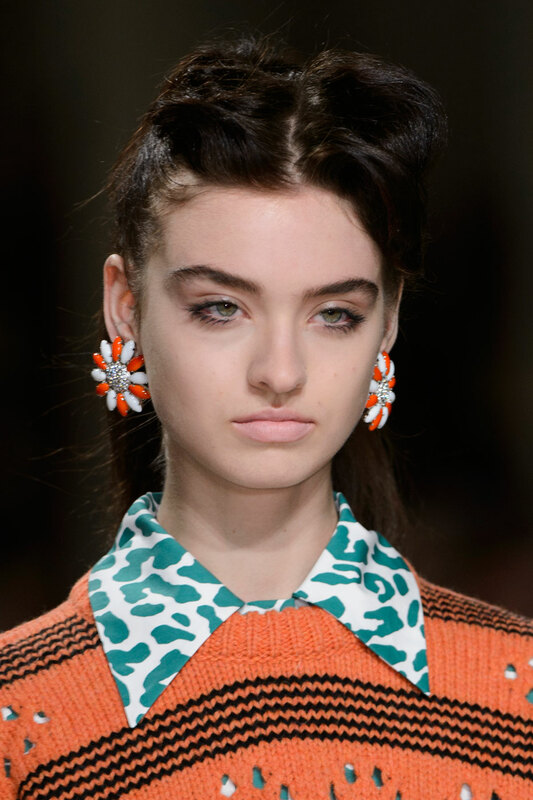 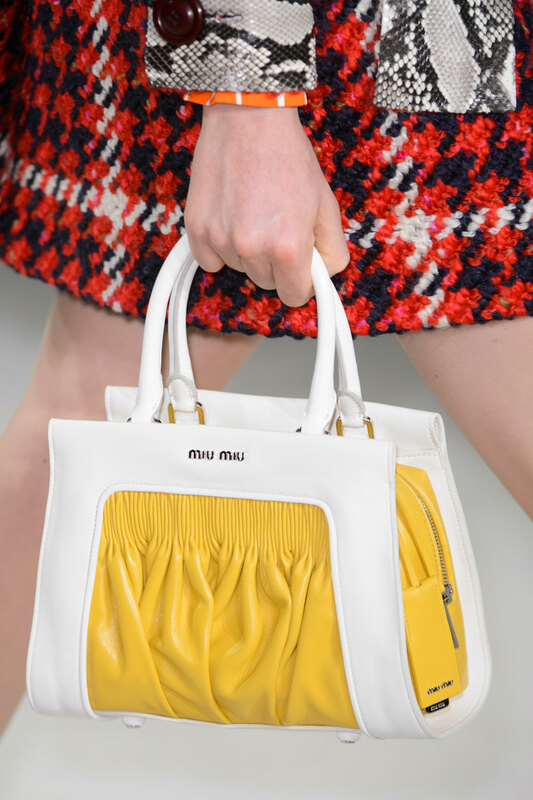 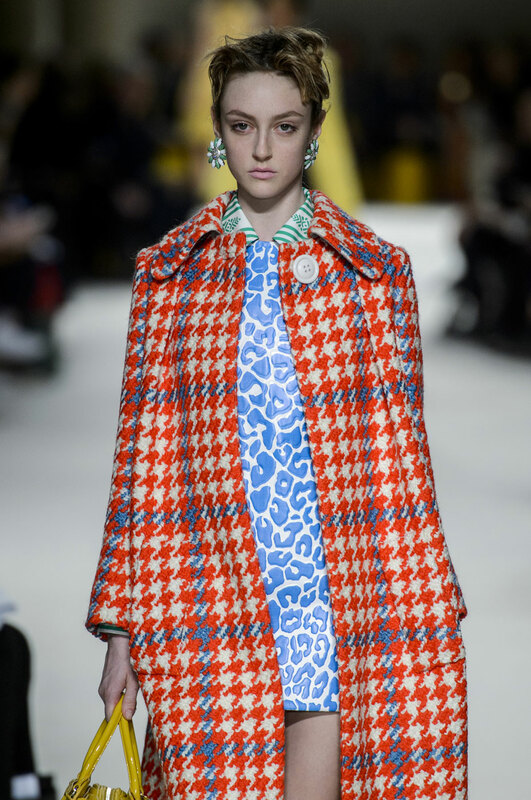 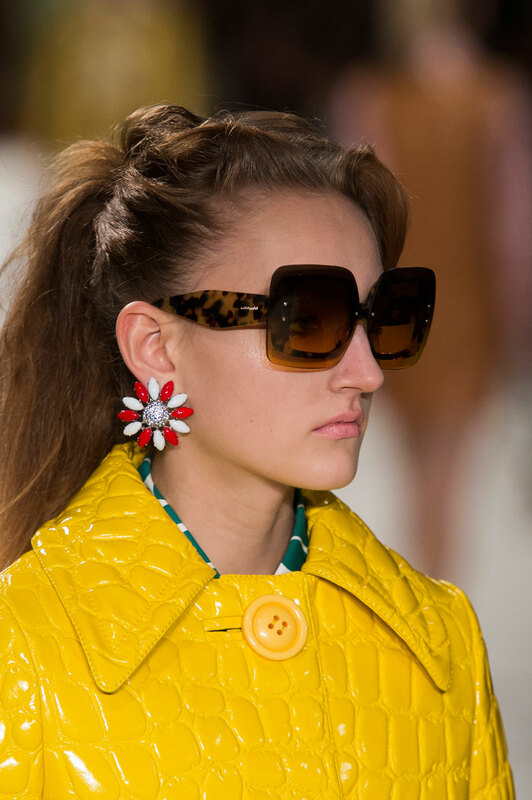 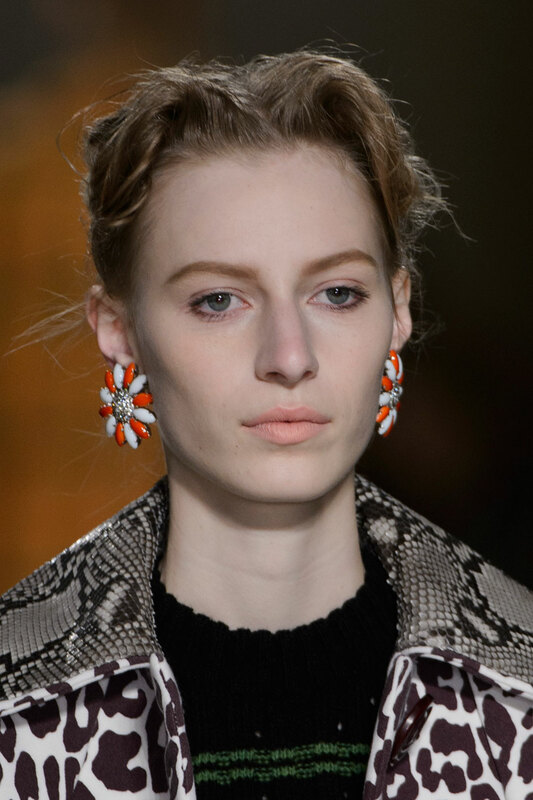 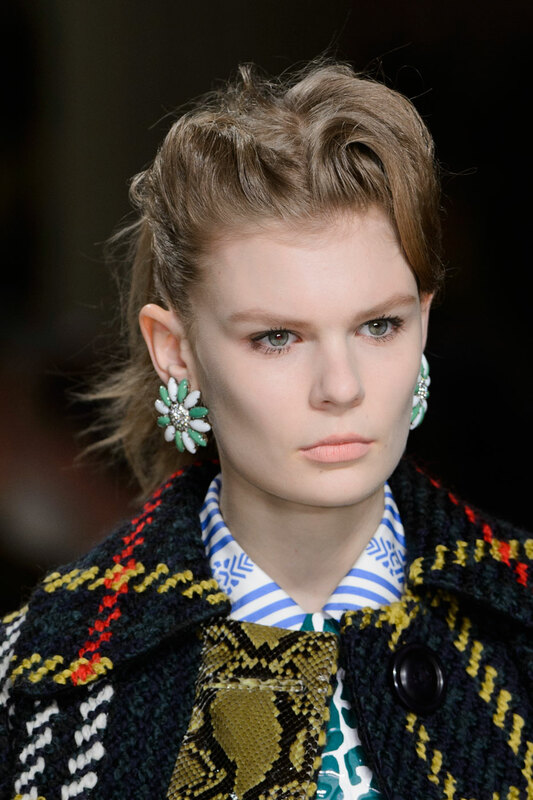 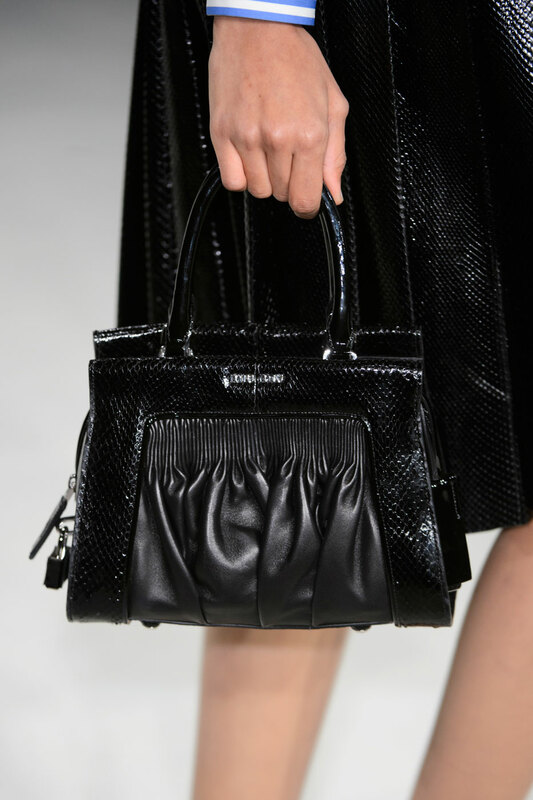 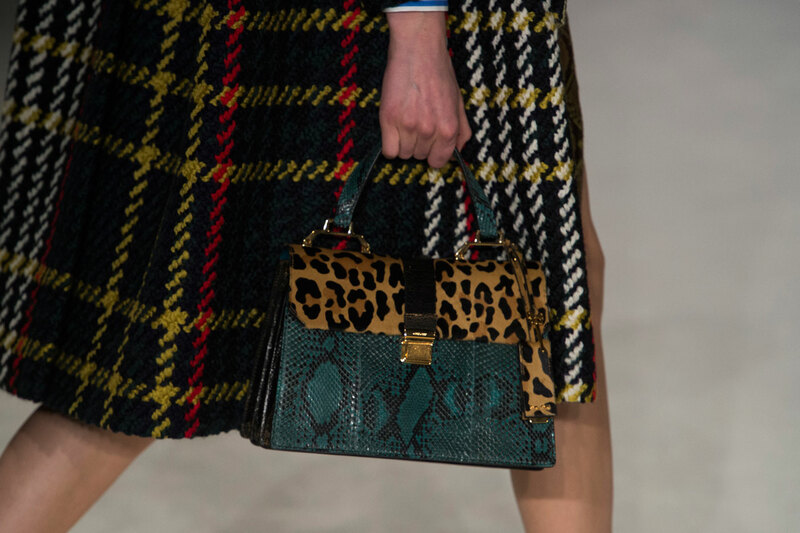 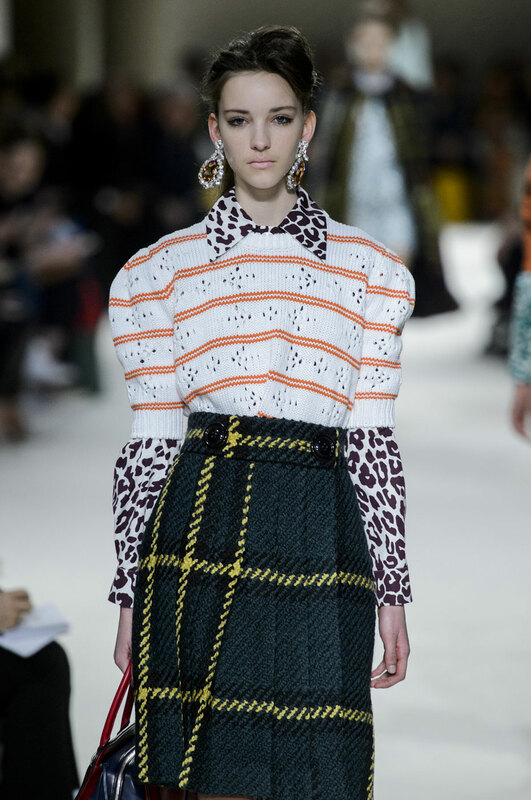 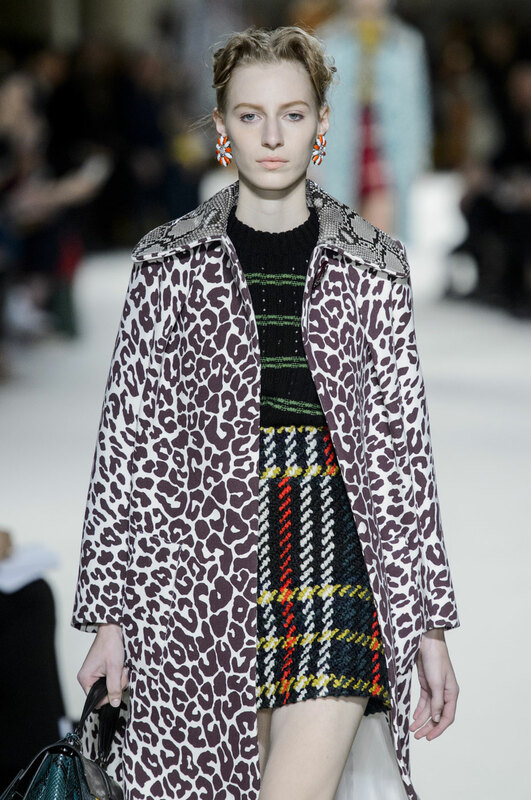 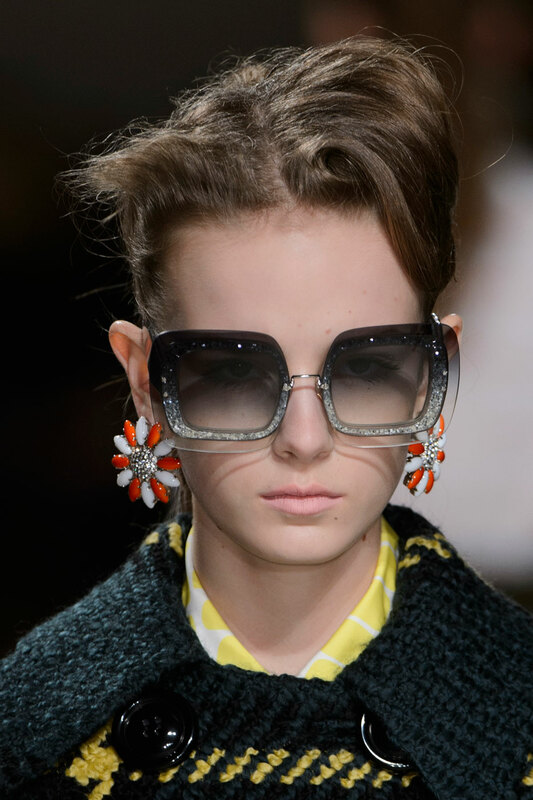 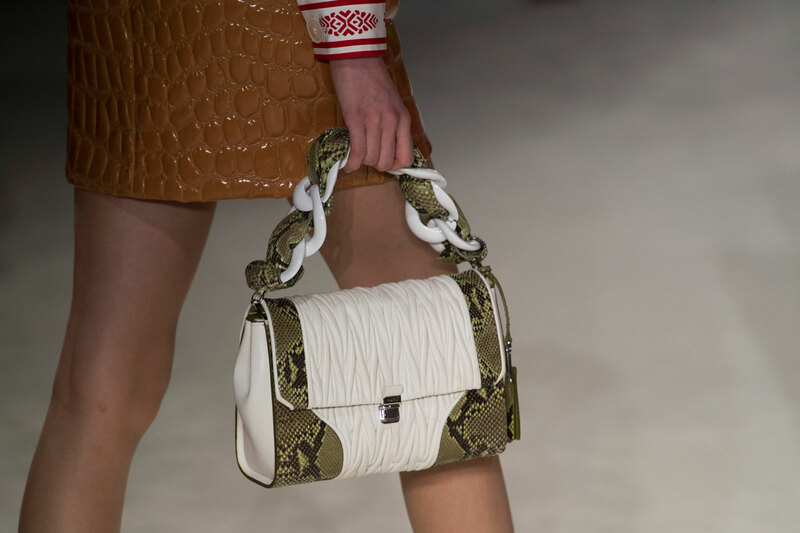 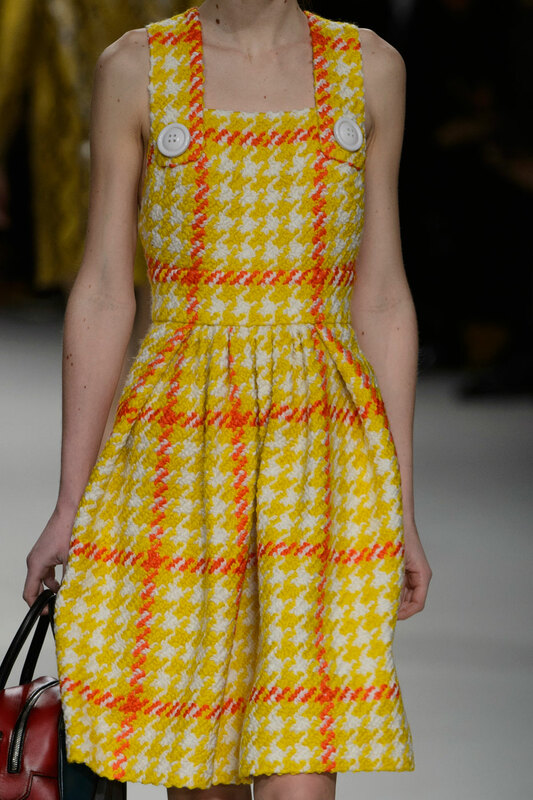 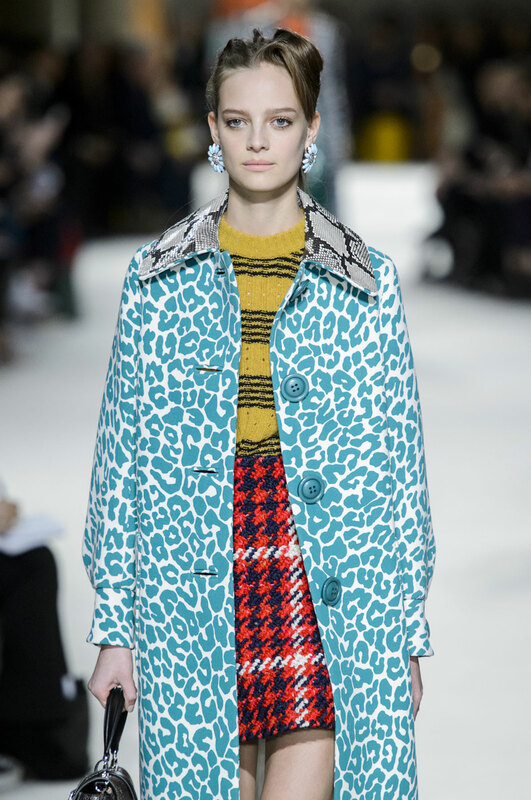 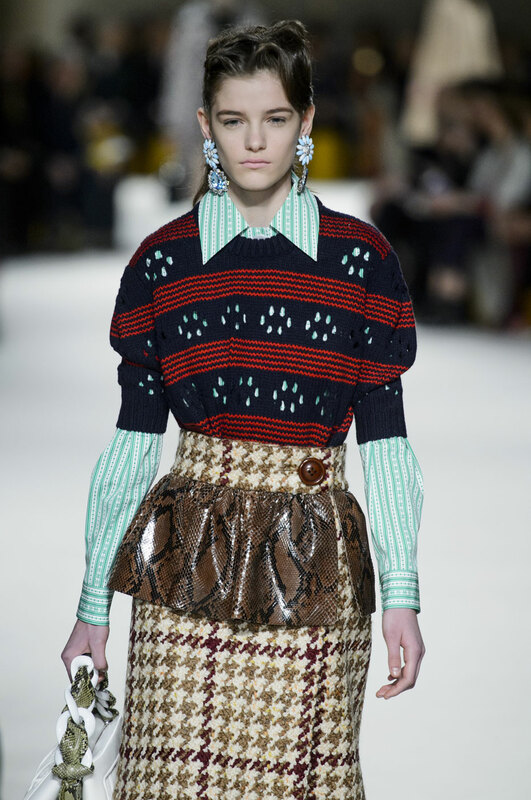 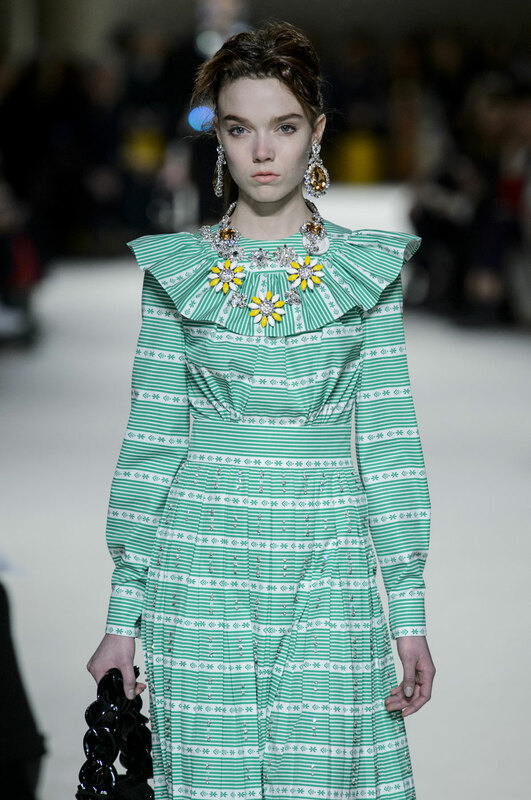 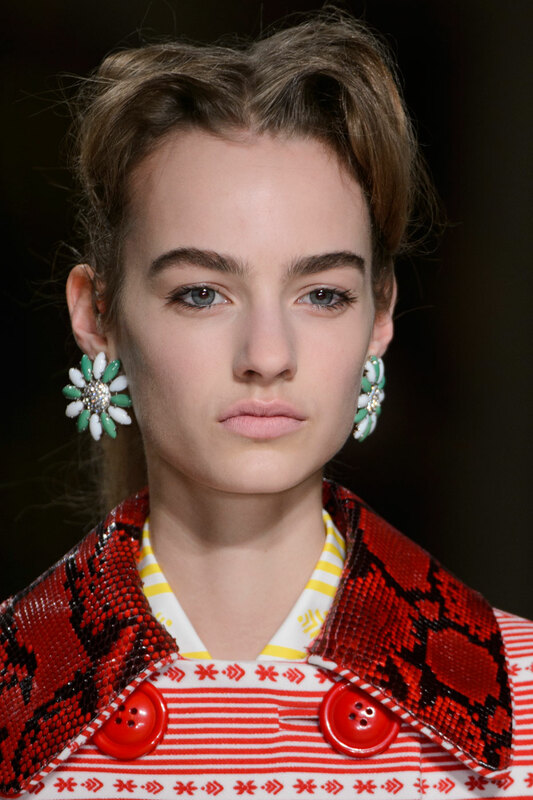 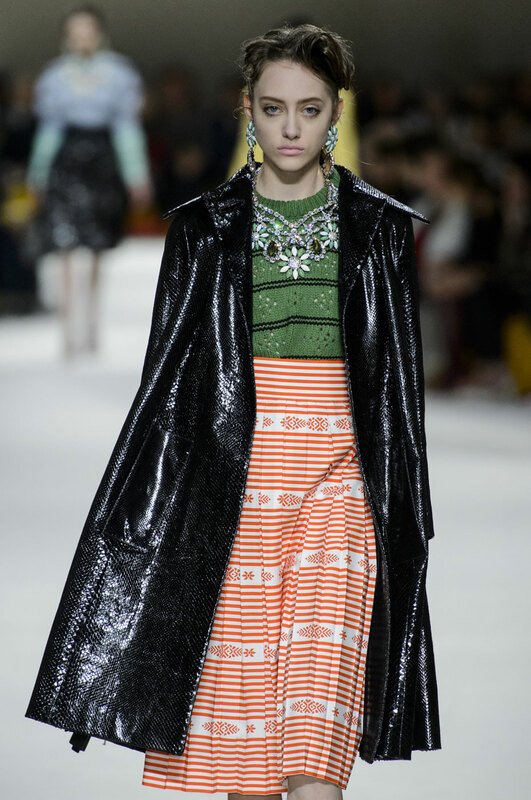 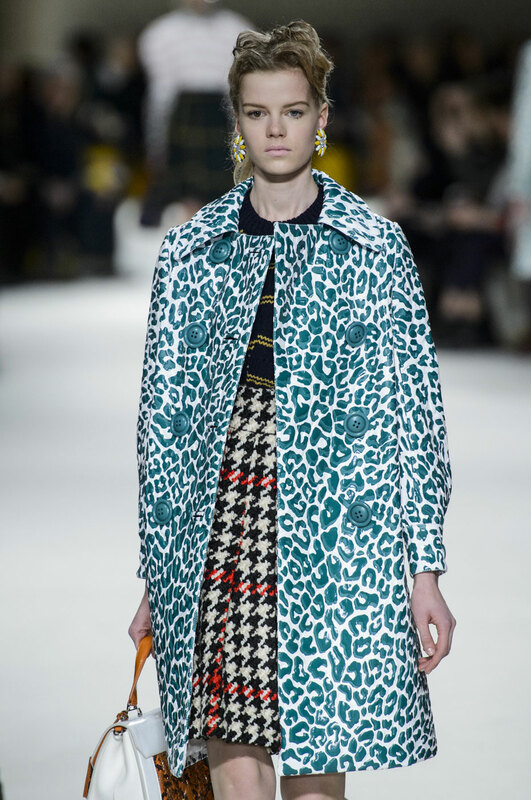 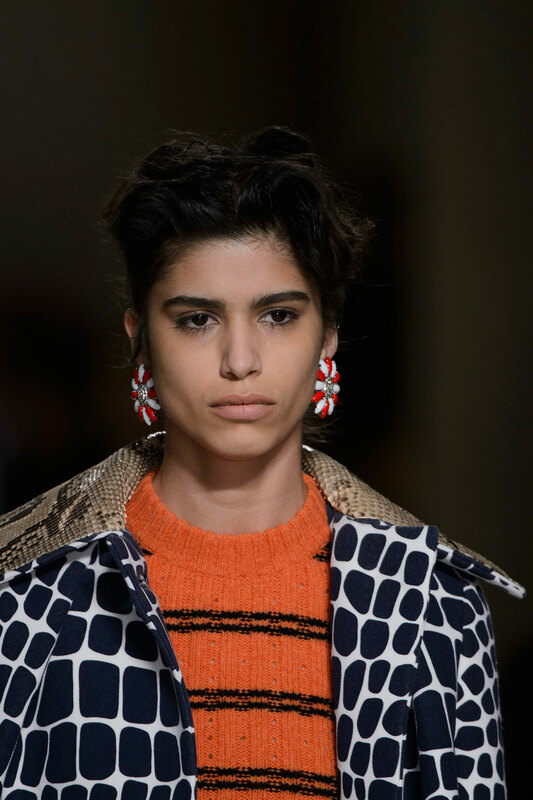 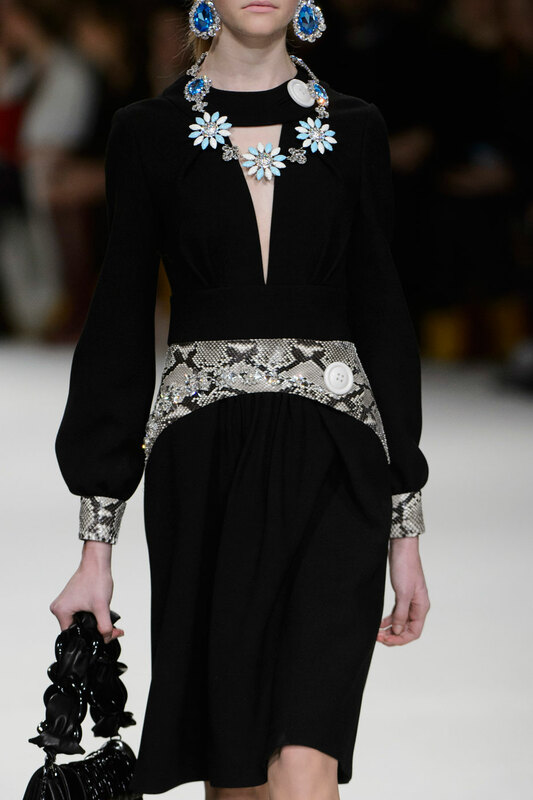 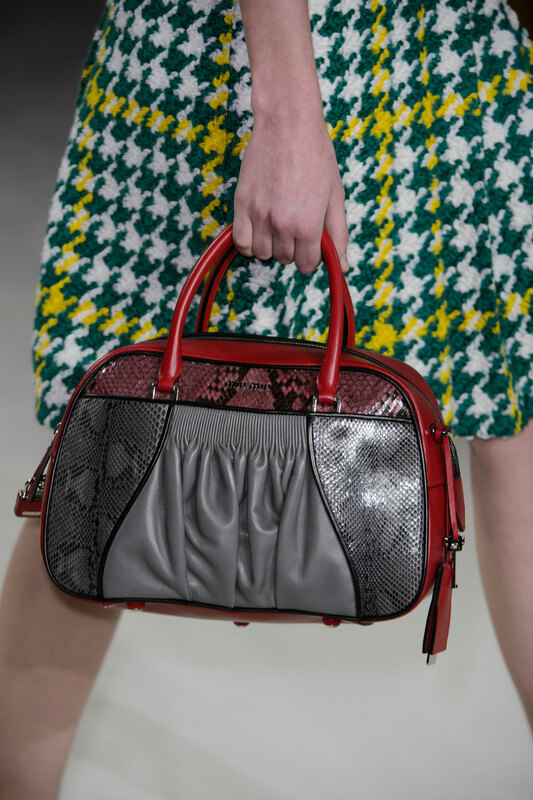 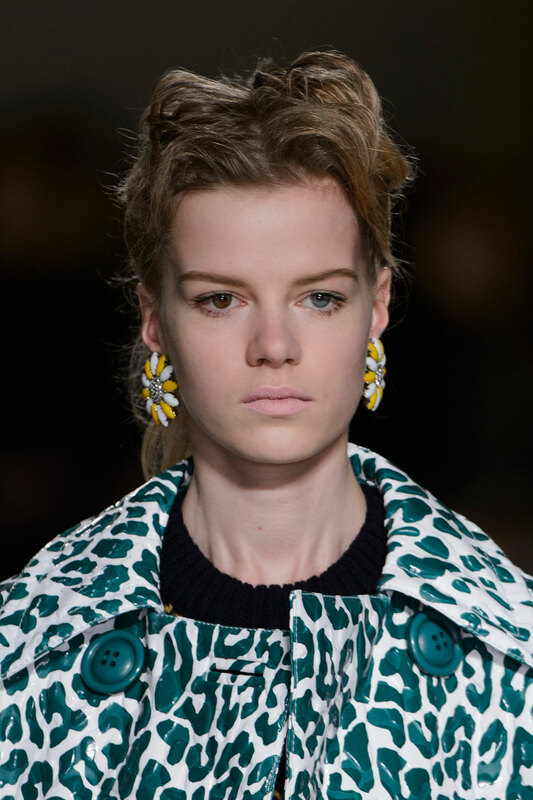 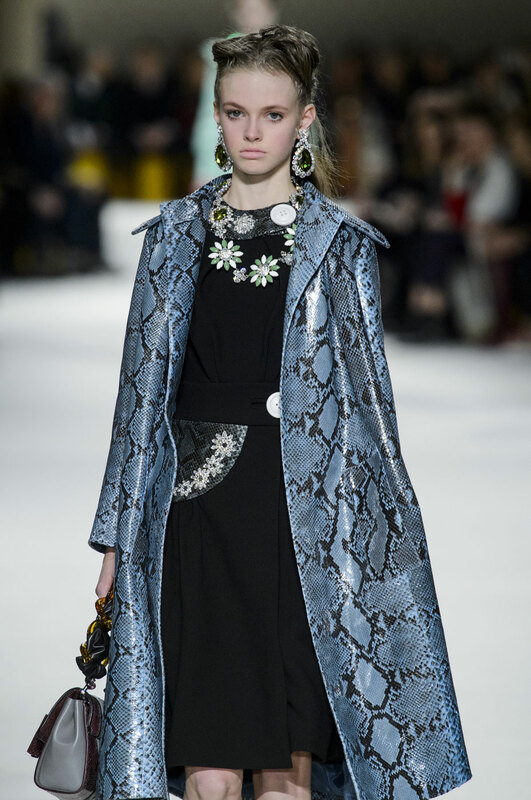 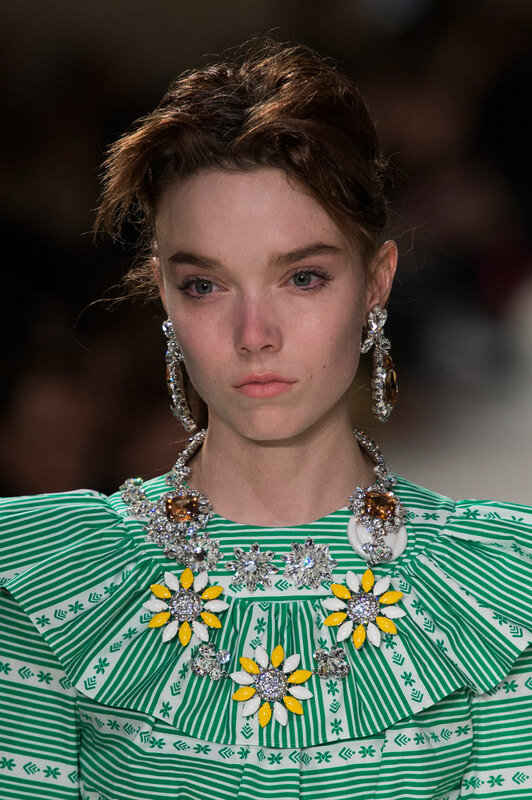 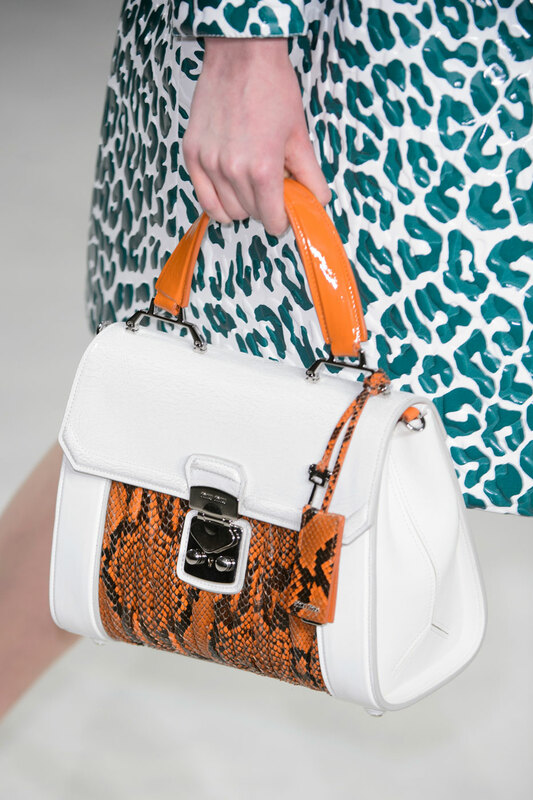 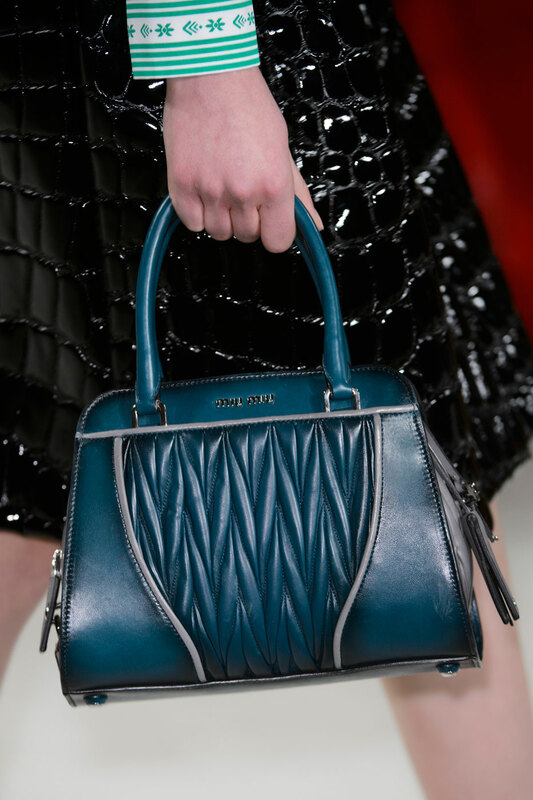 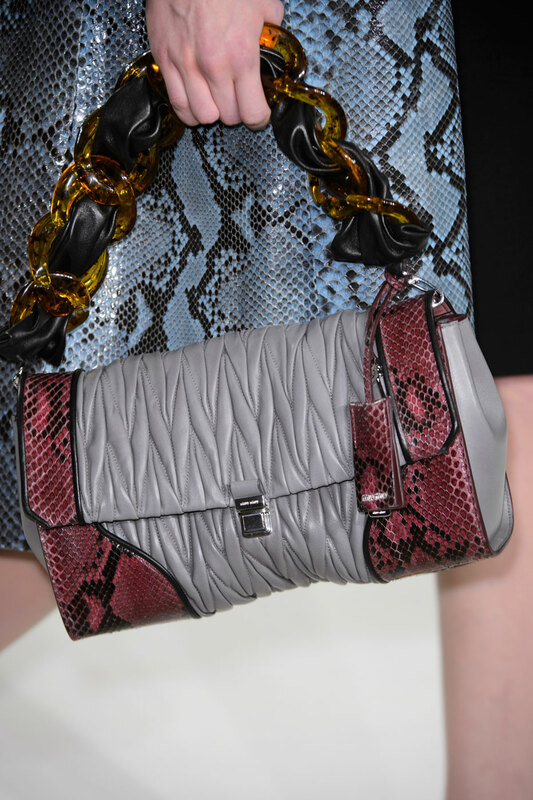 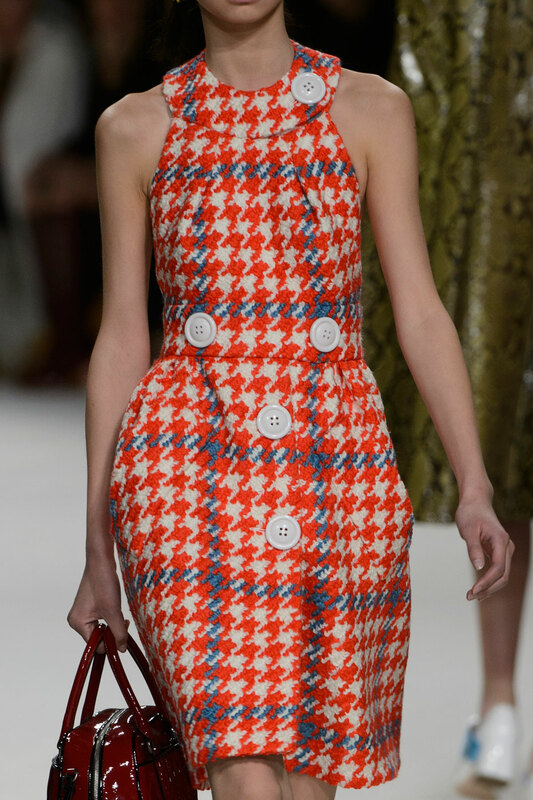 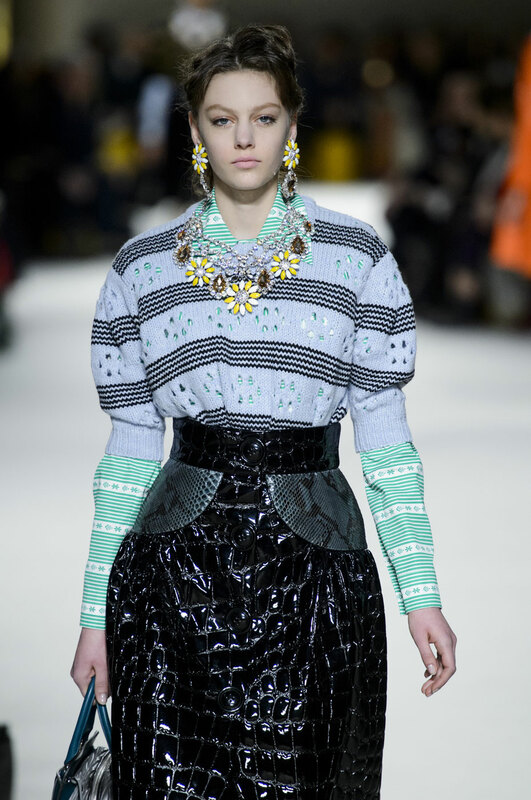 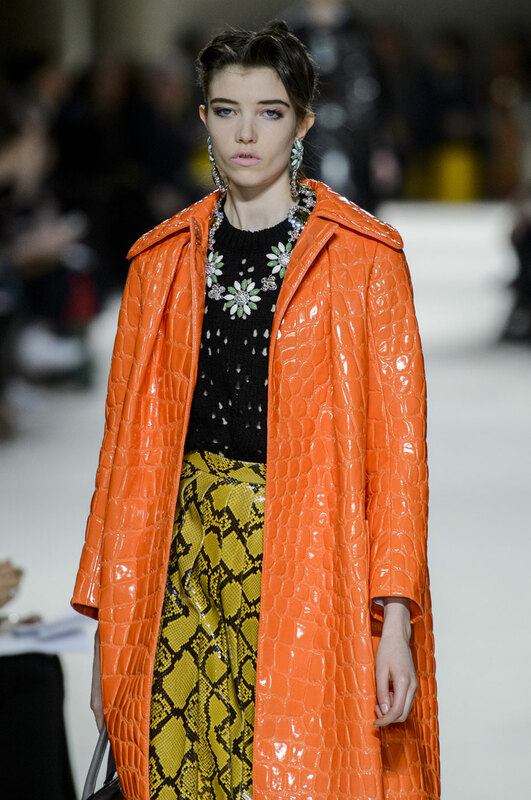 Miu Miu Women Autumn-Winter 2015 – Miuccia Prada closed the Paris shows – and the international ready-to-wear season – with her Miu Miu AW15 collection offering a quirky, colourful, print clashing 60s inspired affair. 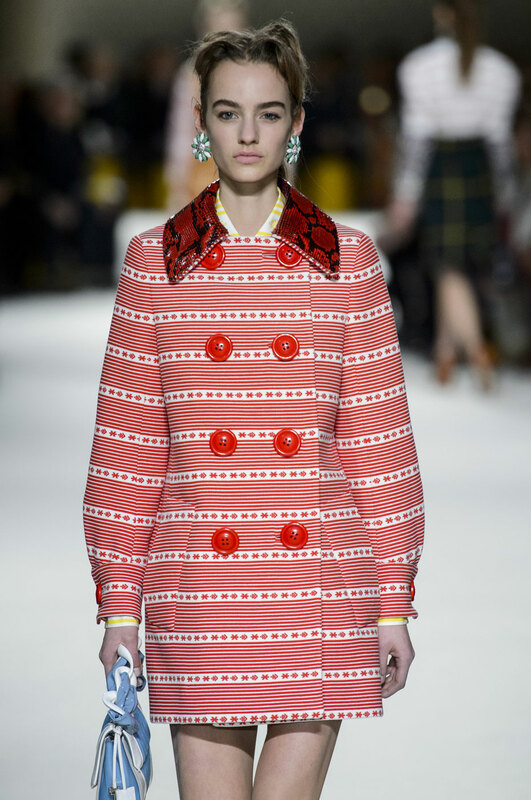 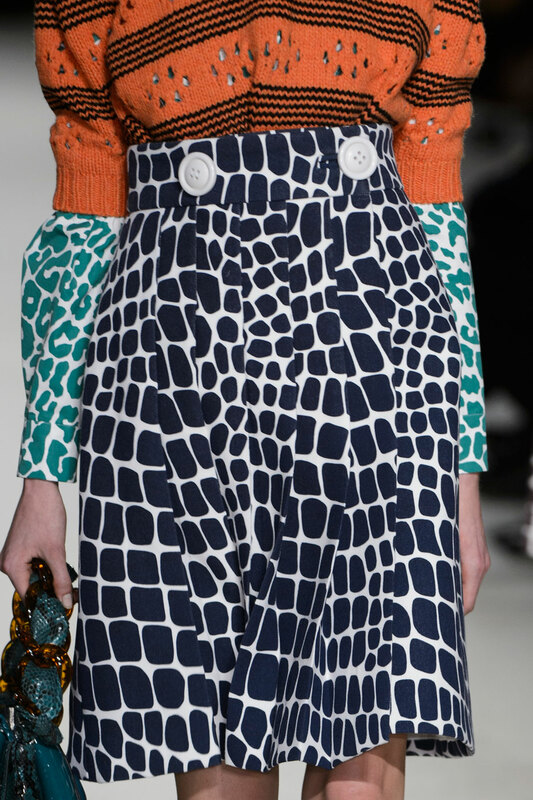 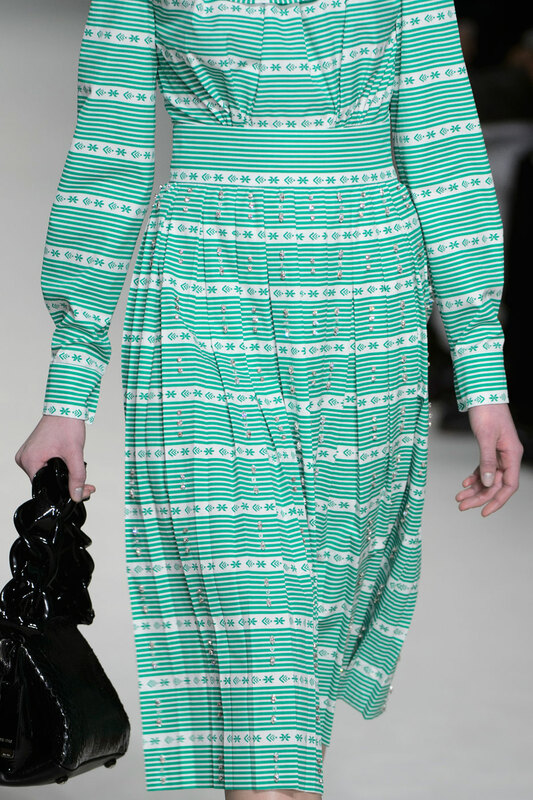 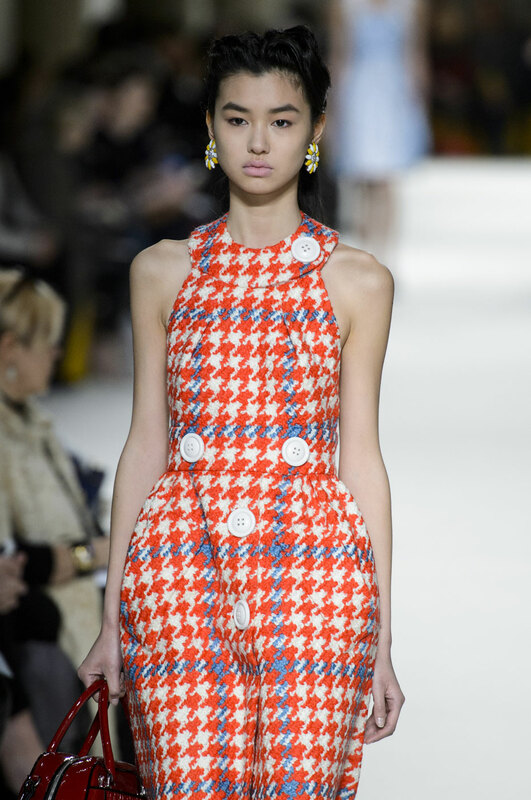 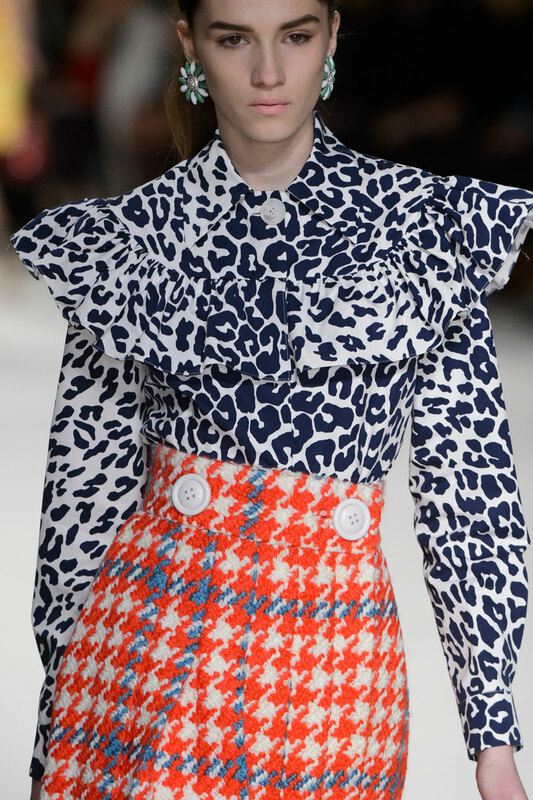 Fun house and funky fabrics electrocuted silhouettes that seemed to emanate from the Sixties. 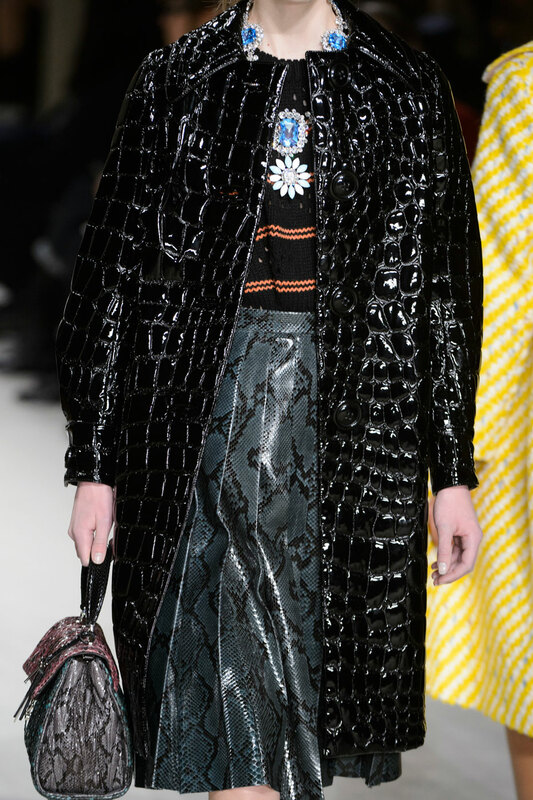 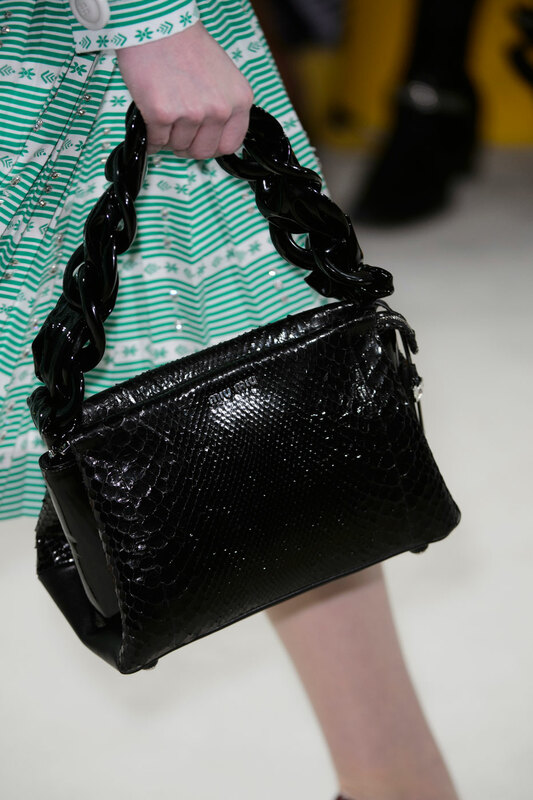 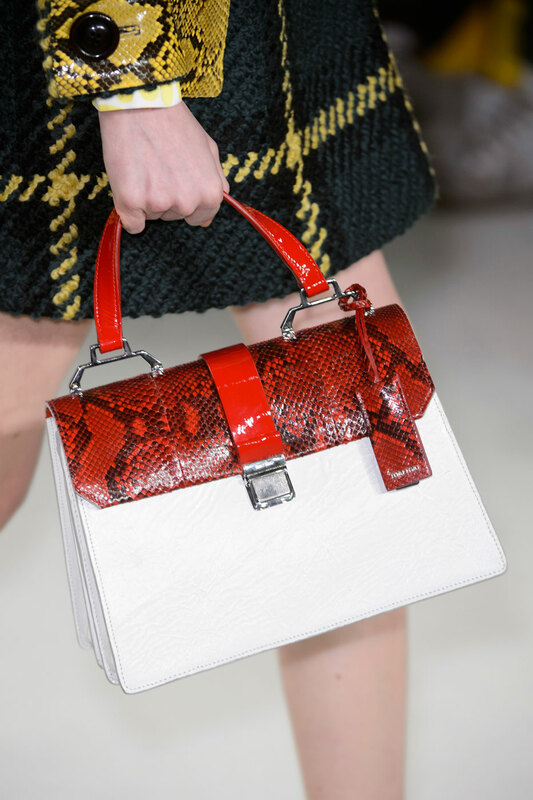 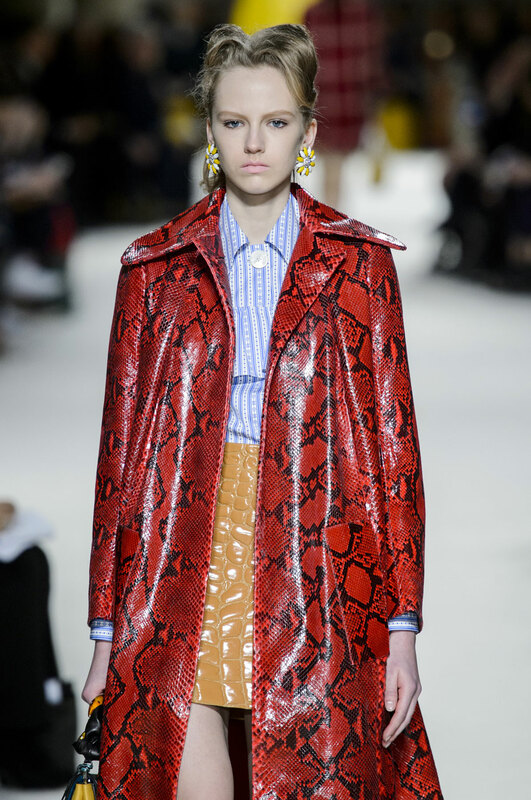 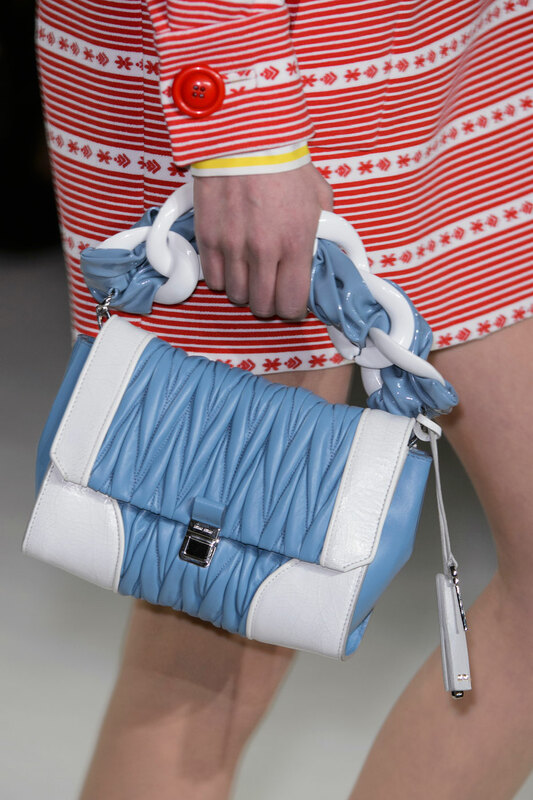 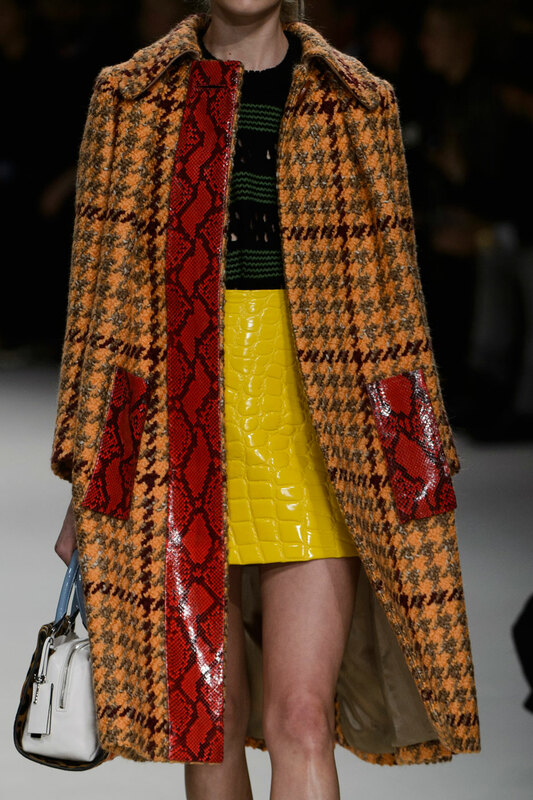 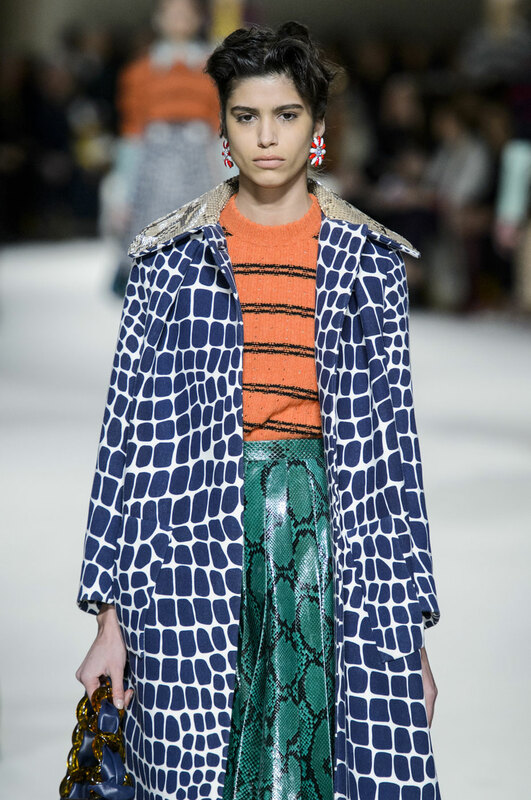 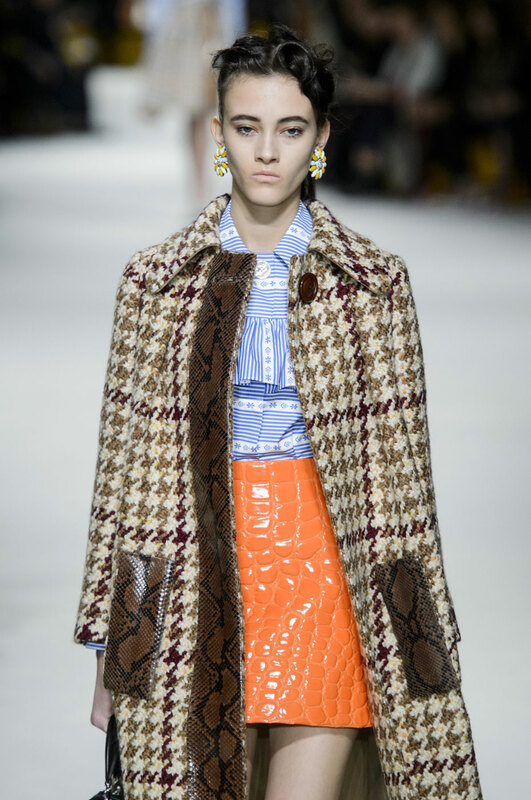 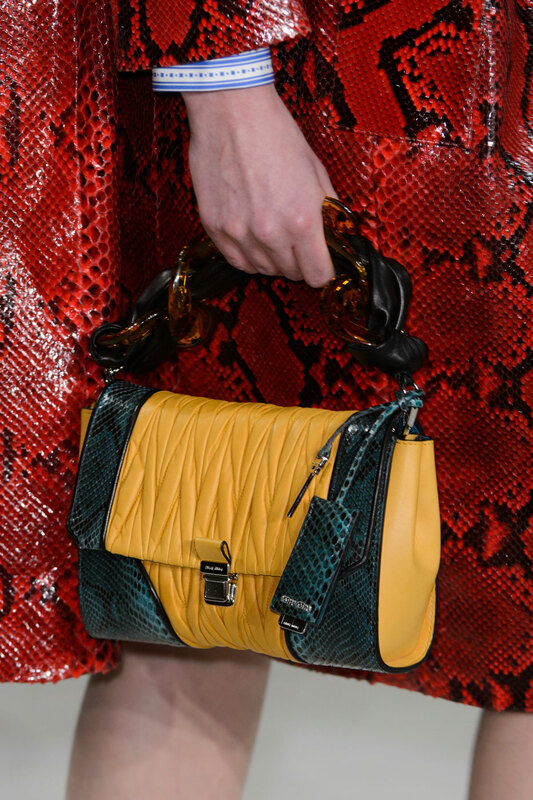 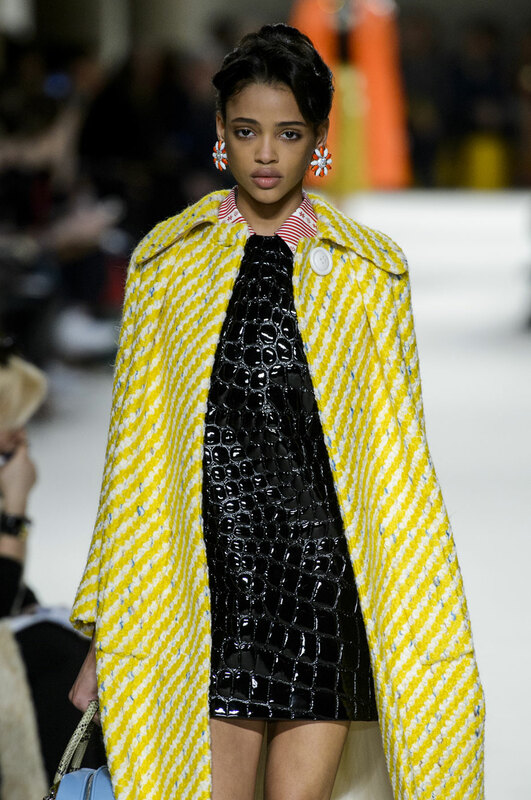 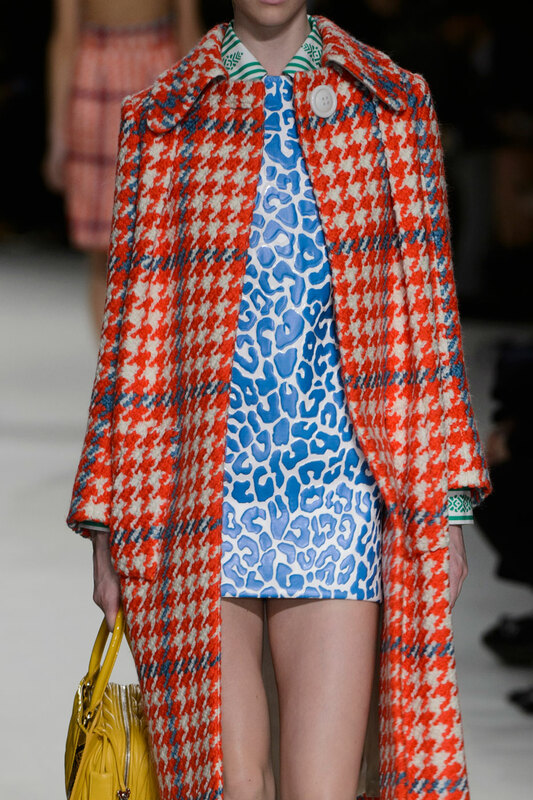 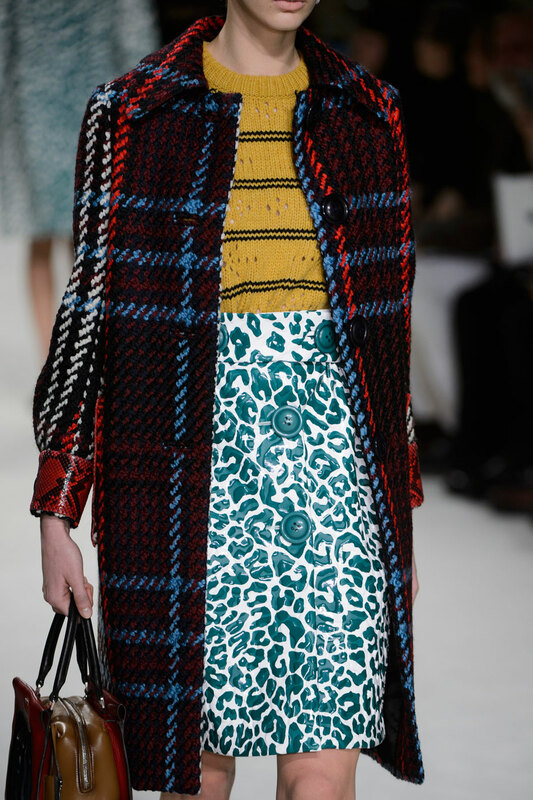 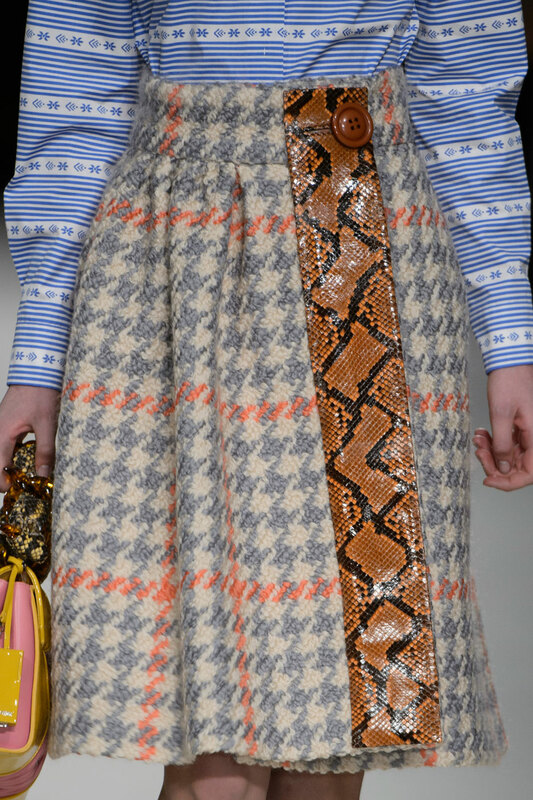 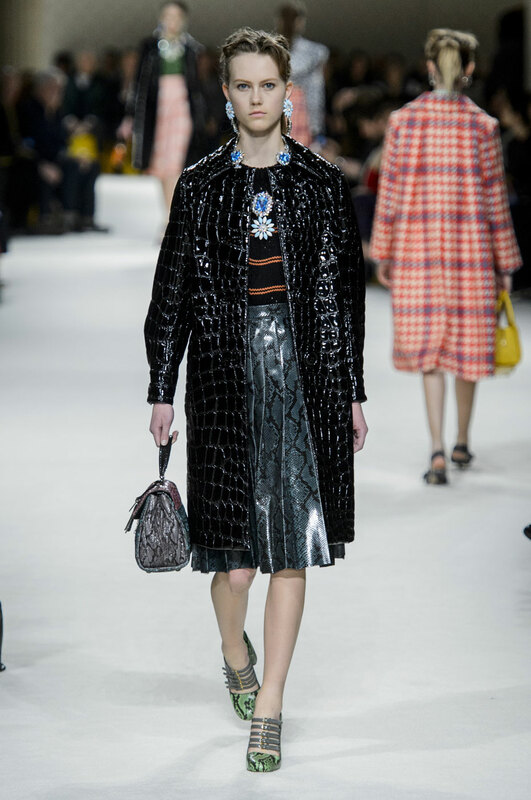 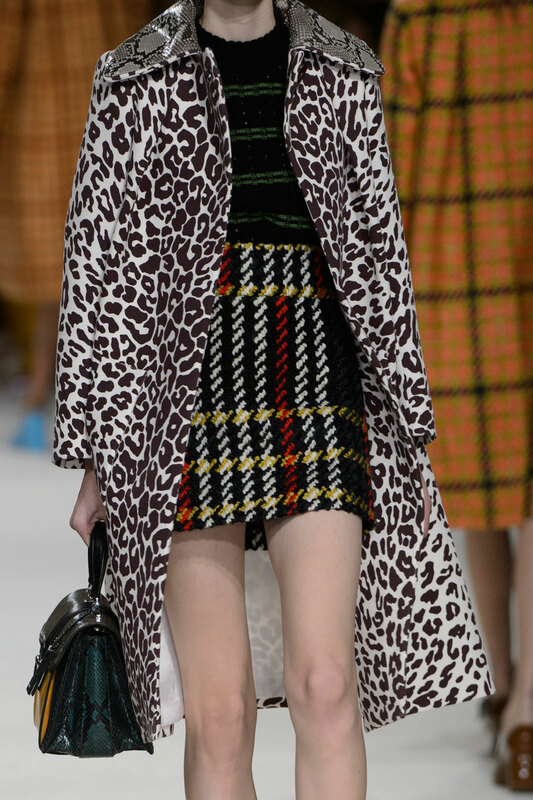 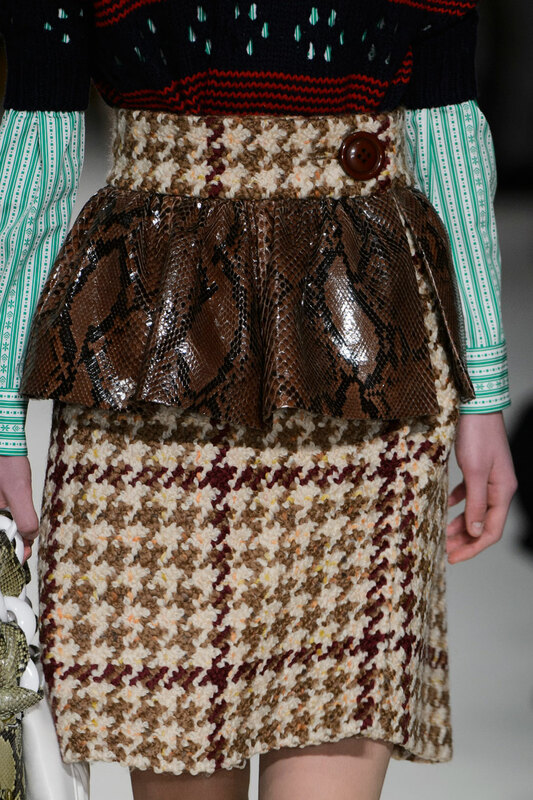 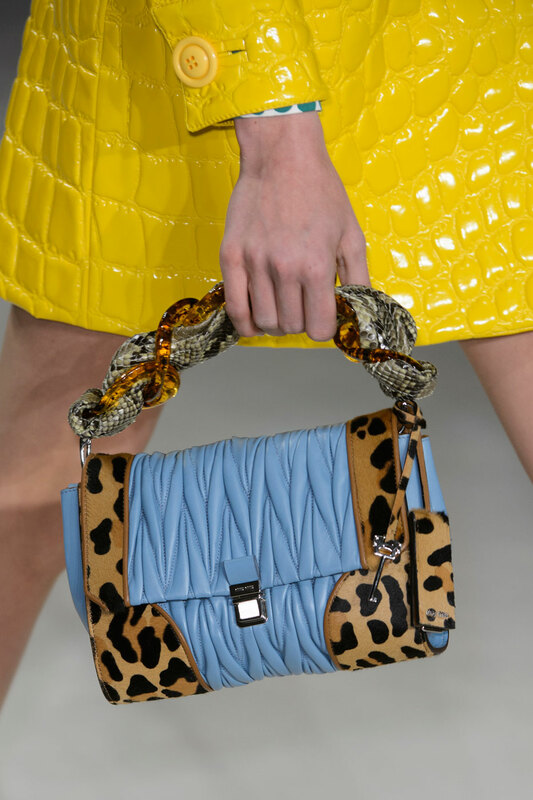 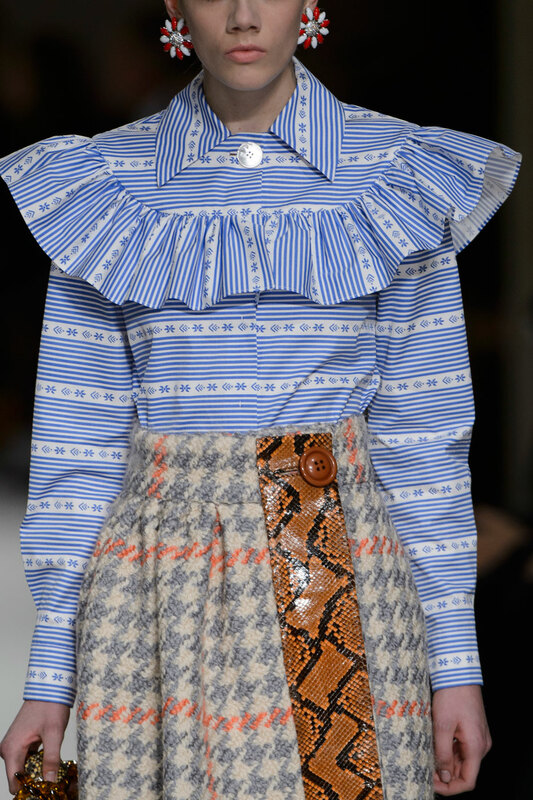 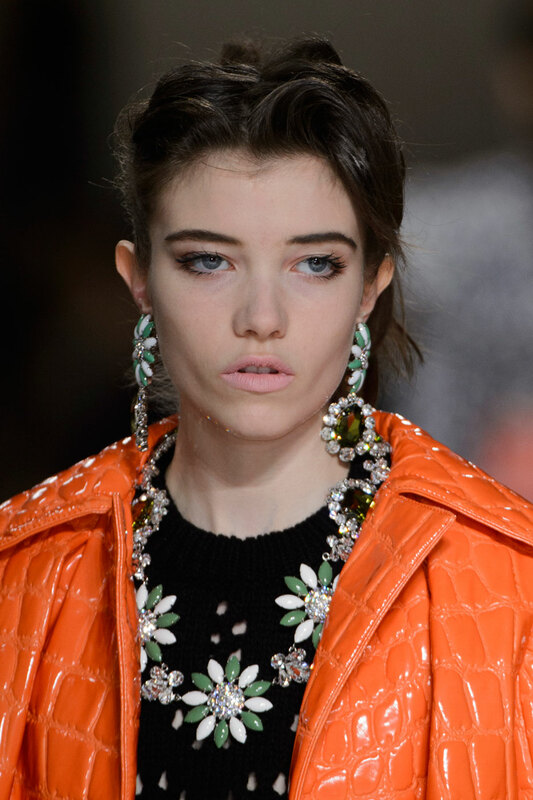 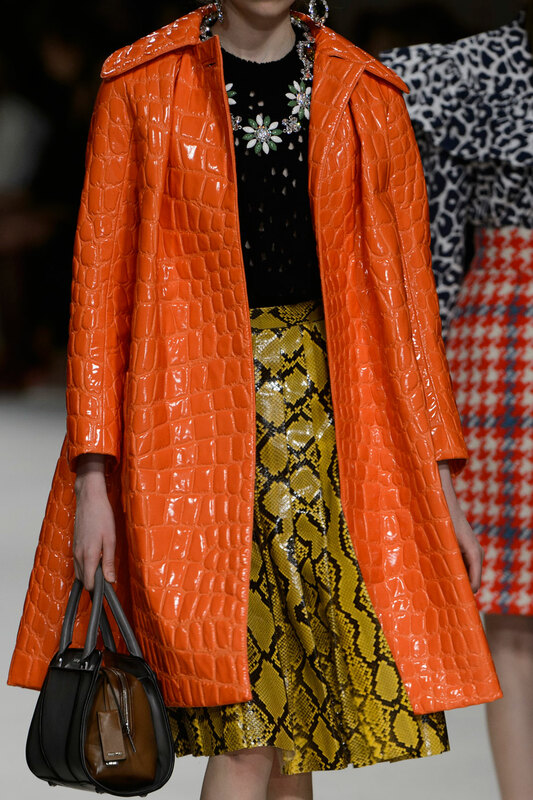 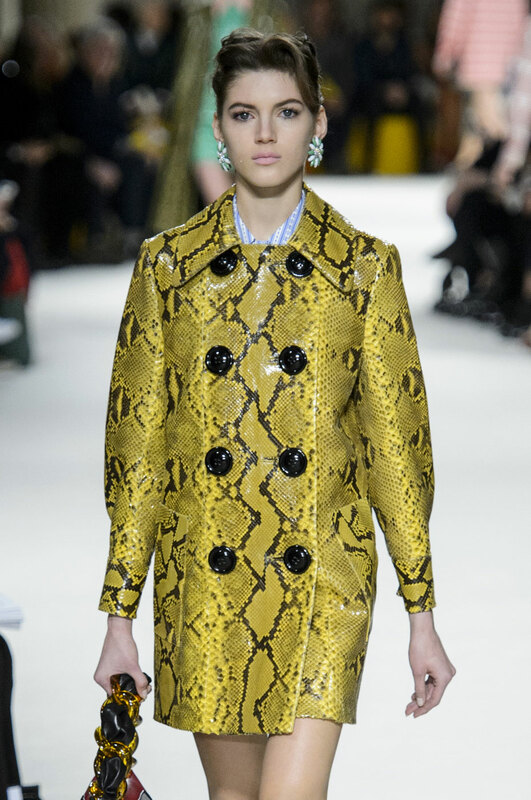 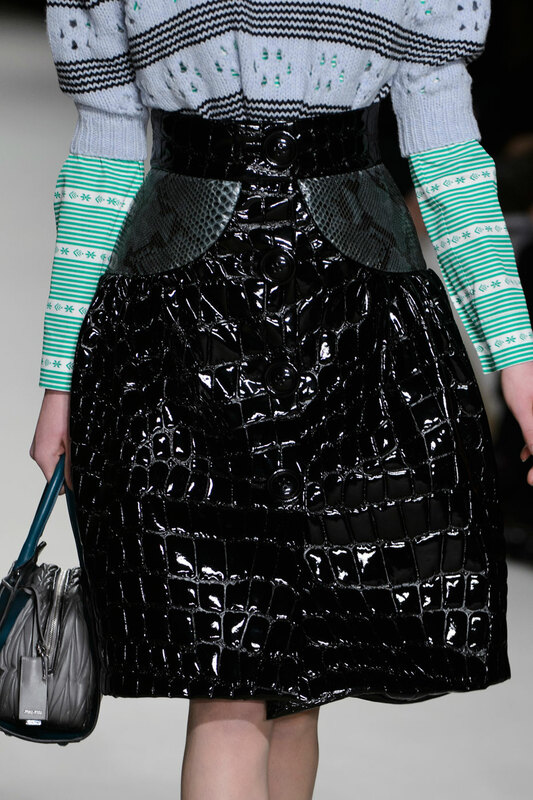 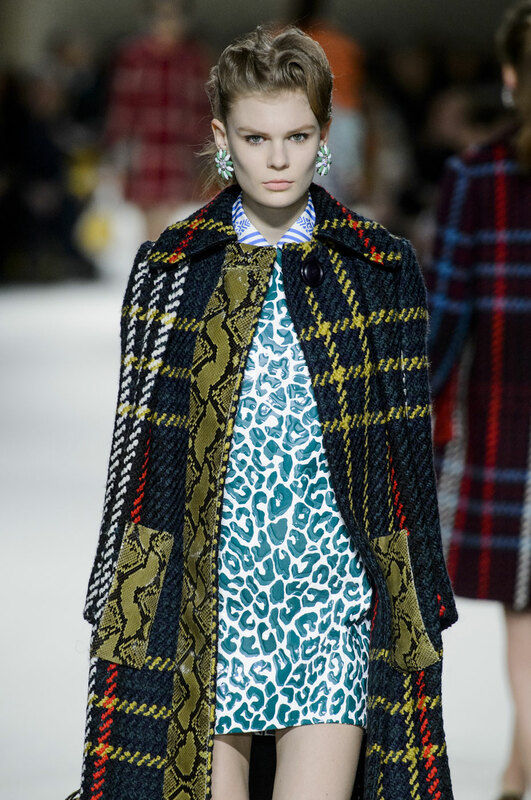 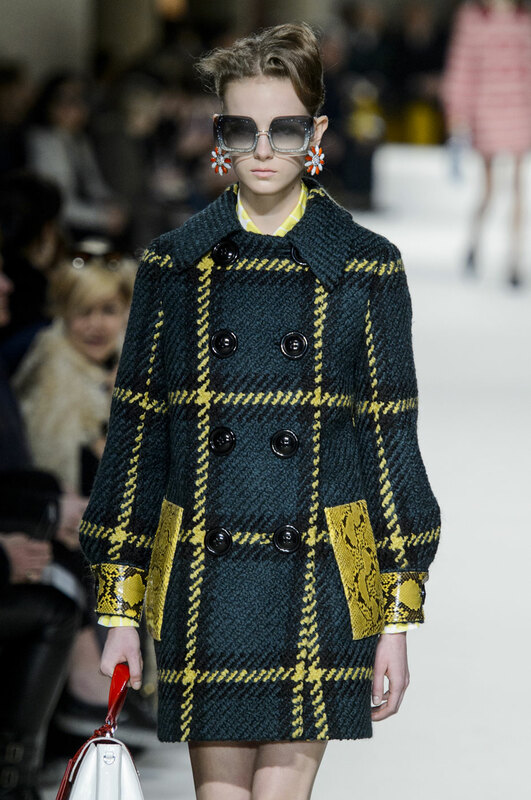 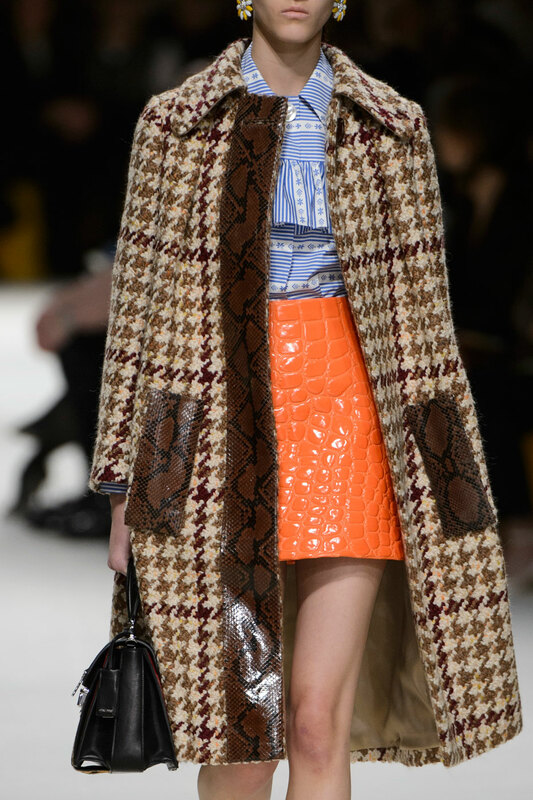 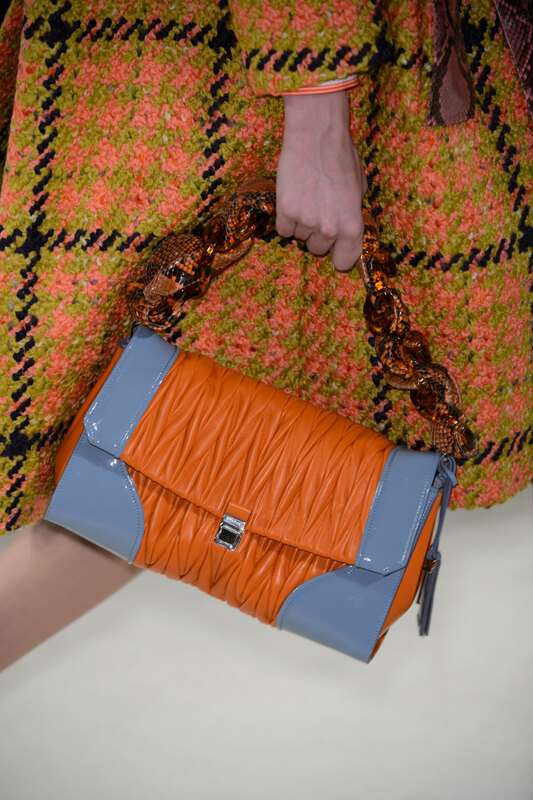 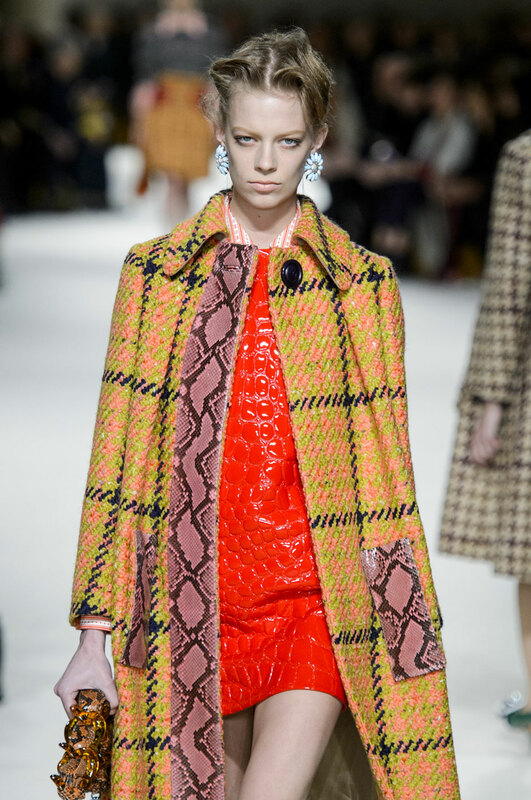 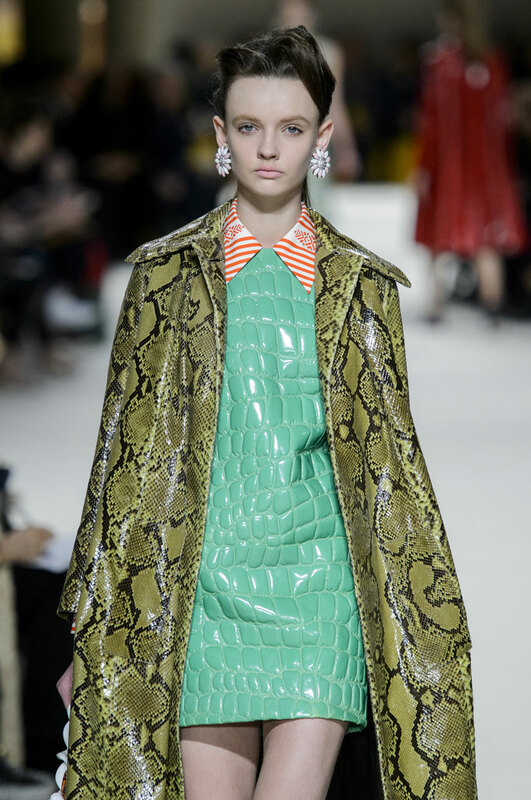 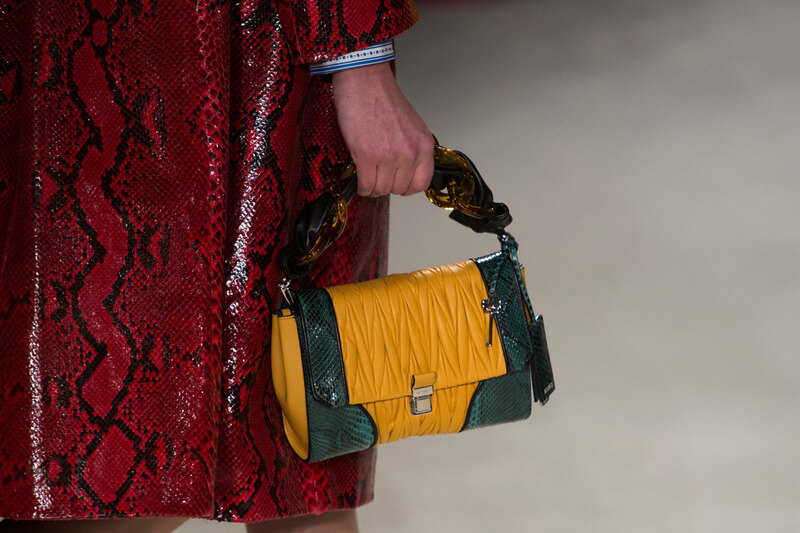 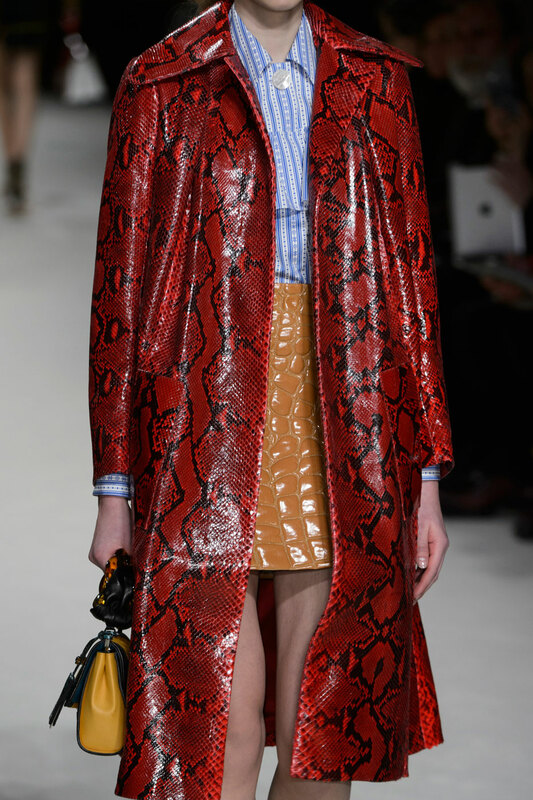 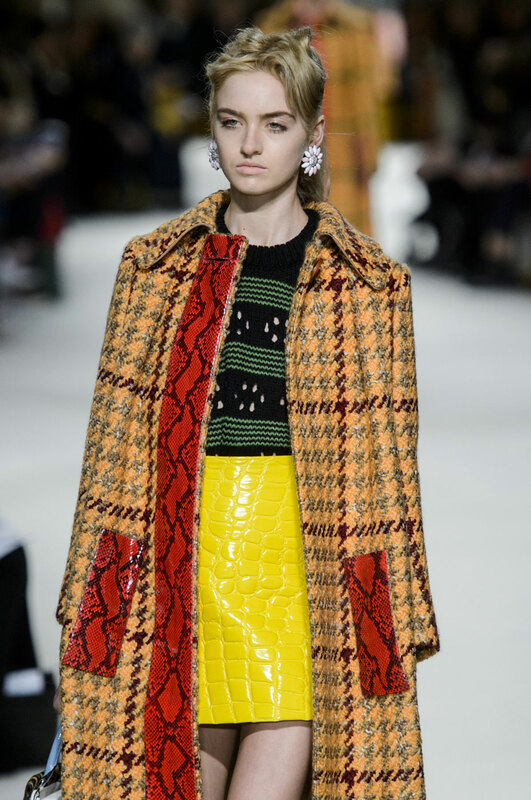 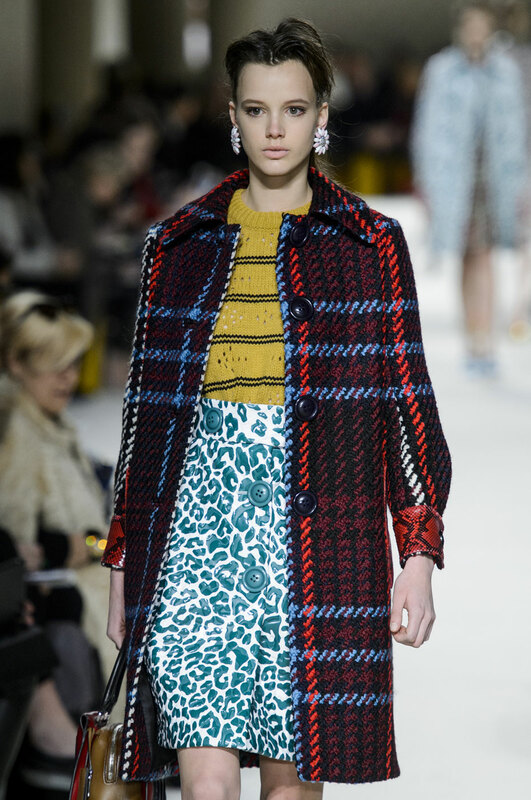 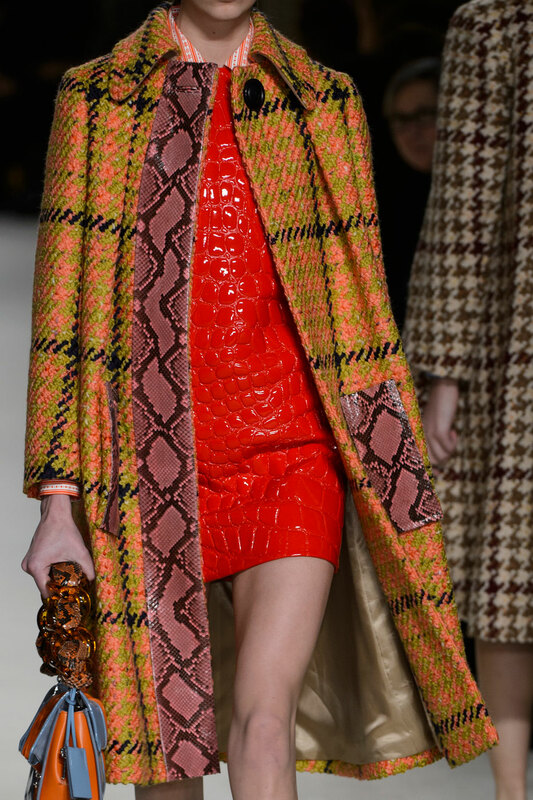 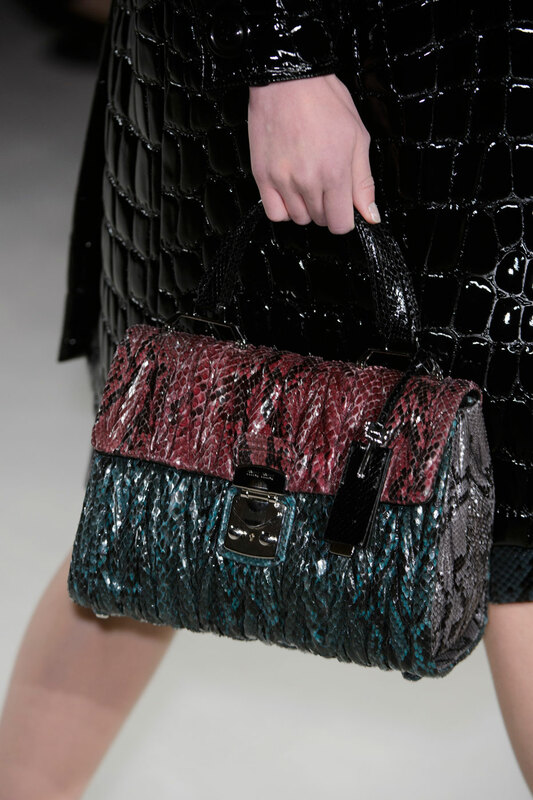 The Miu Miu girl wore A-line swing coats with big collars in herringbone plaids trimmed with clashing python pockets and borders layered over patent crocodile skin patterned mini-skirts in rainbow colours and striped shirts with ruffled detailing across the shoulders. 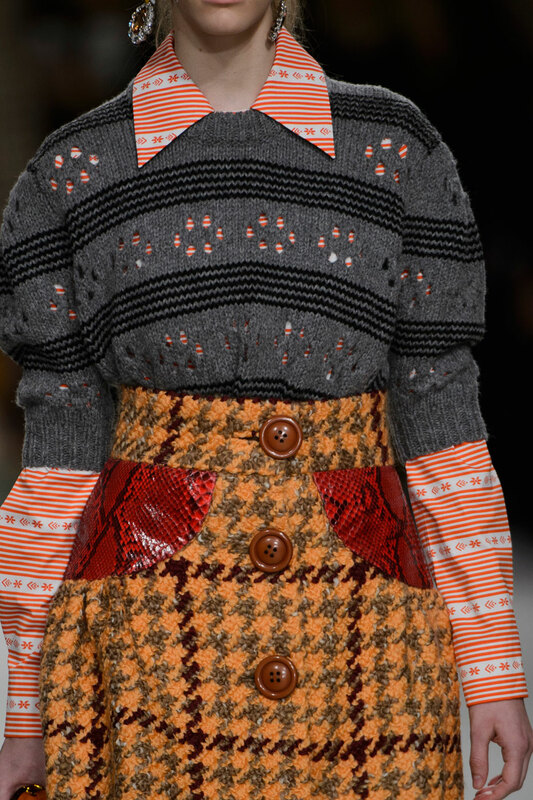 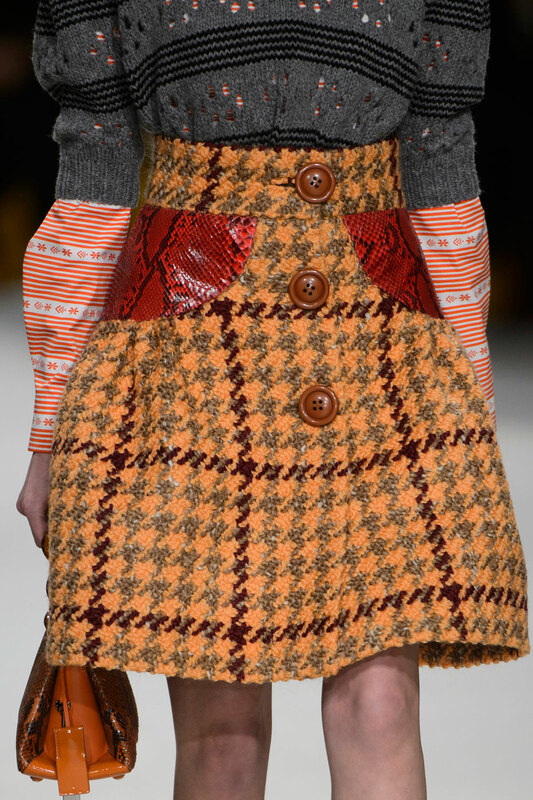 She wore her heavy wool tartan and tweed high-waisted skirts and her baby knit sweaters – with a puffed sleeve in sorbet colours. 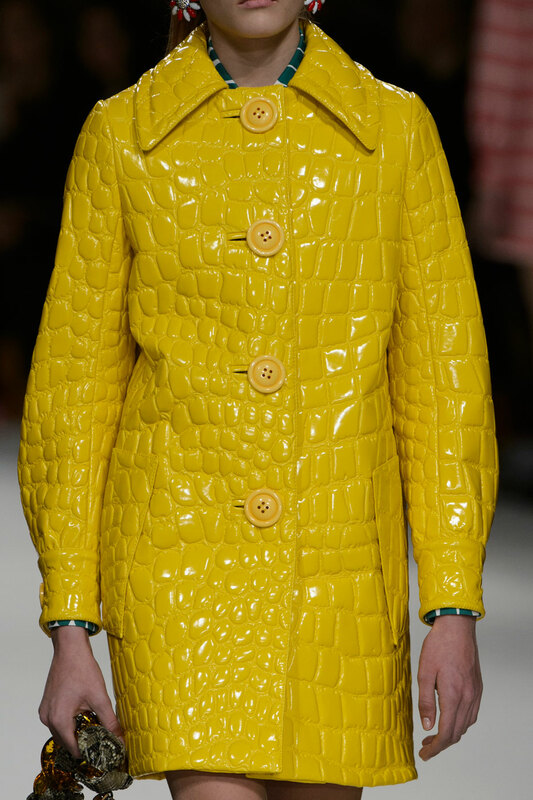 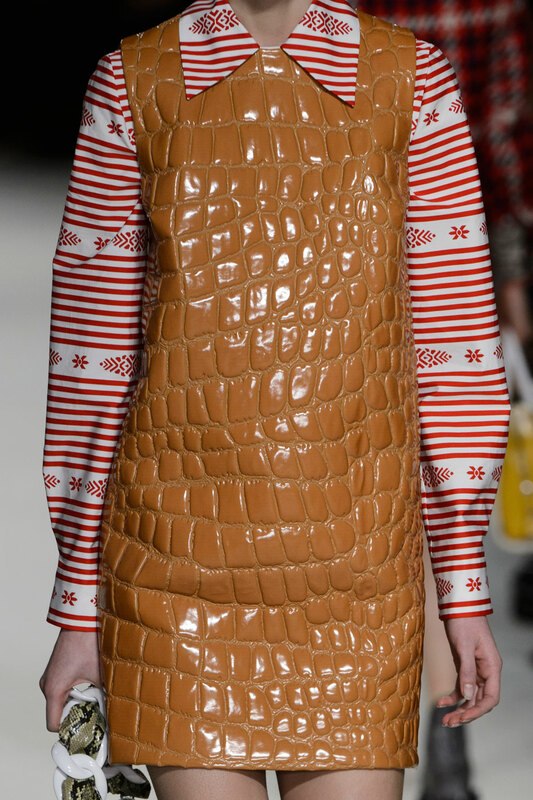 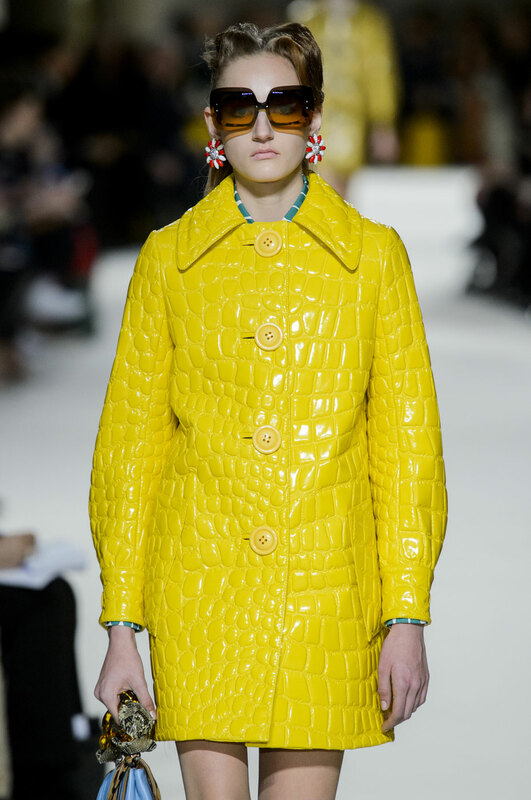 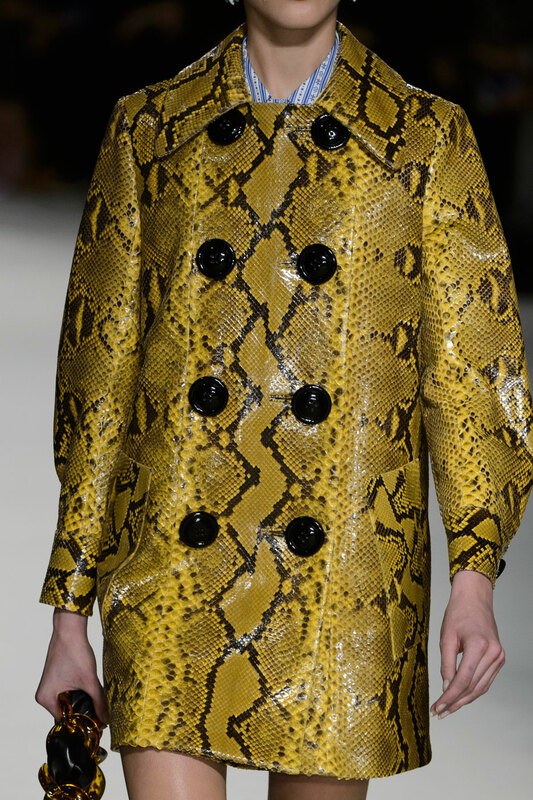 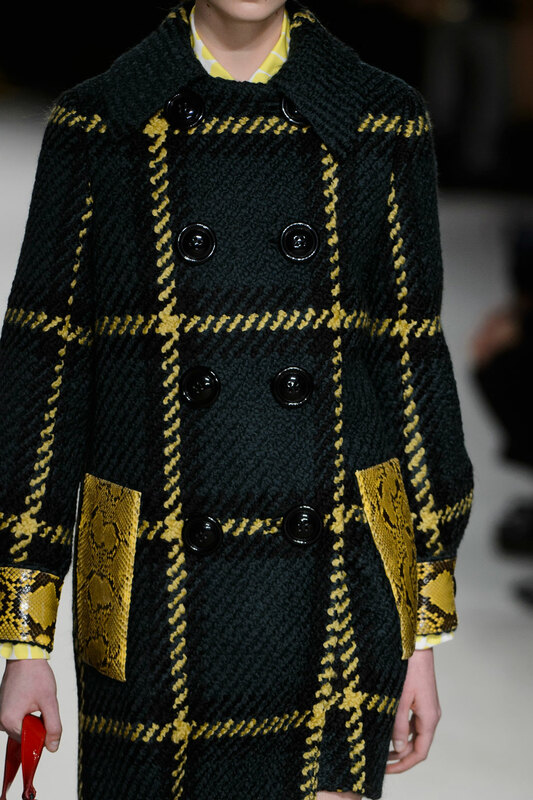 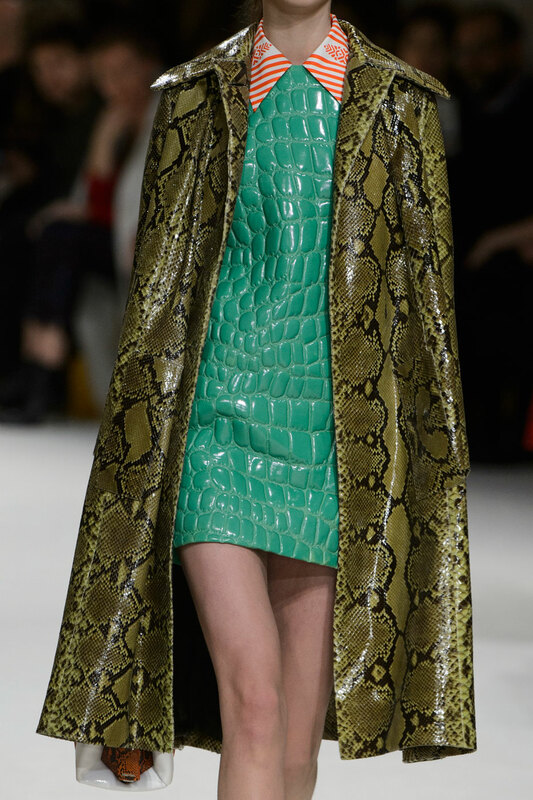 Then came the double breasted Pea coats and apron dresses detailed with big plastic buttons adding a feminine silhouette with a slightly cinched in waist. 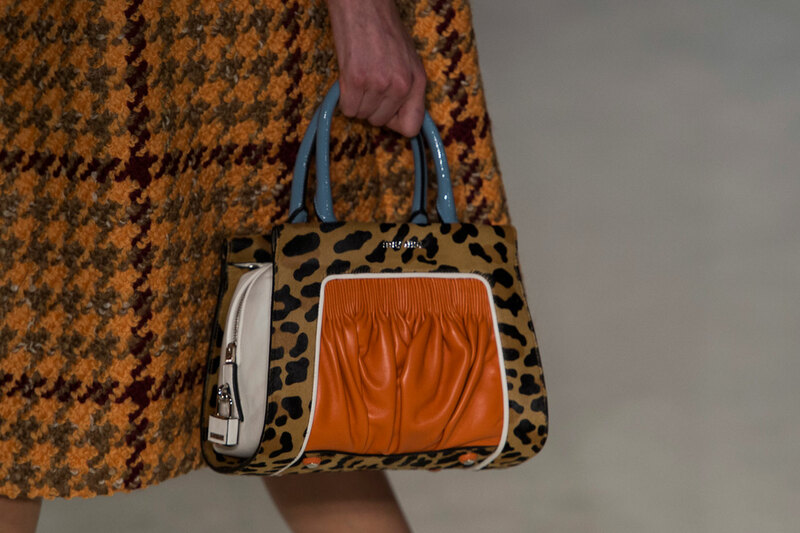 The palette was wacky with an array of bold colours and print motifs; sky blue leopard, candy coloured croc, mint green stripes red python to name a few. 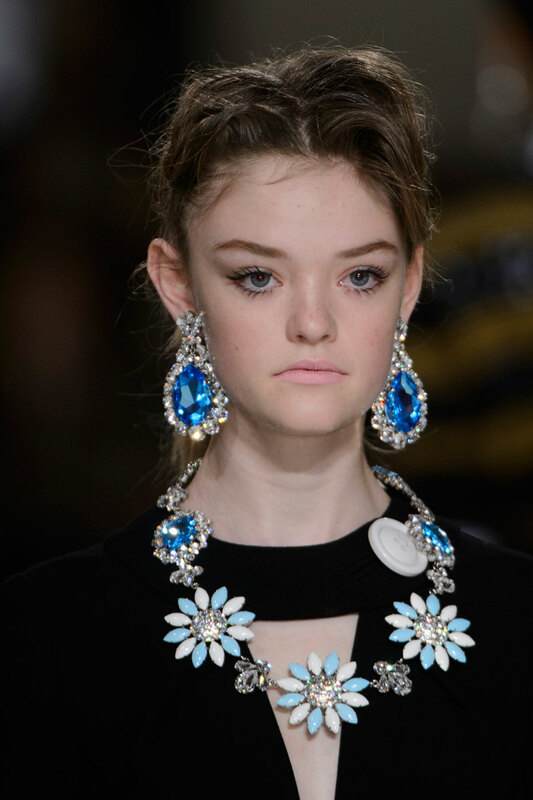 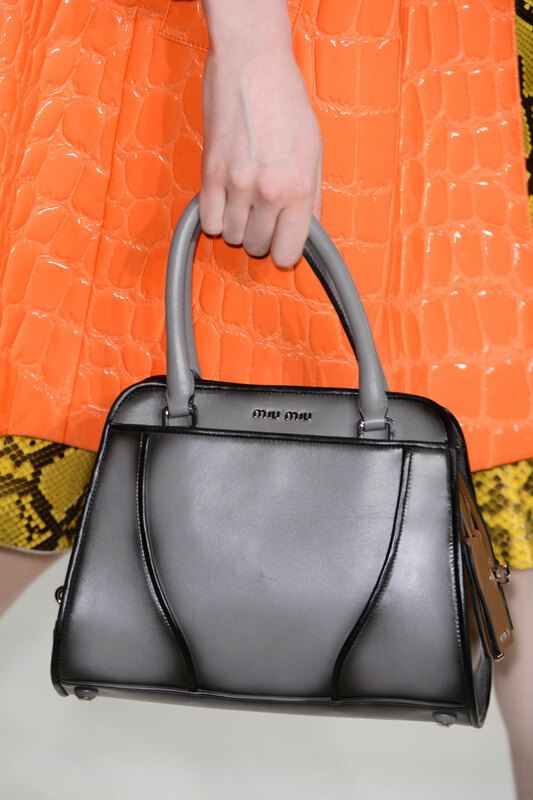 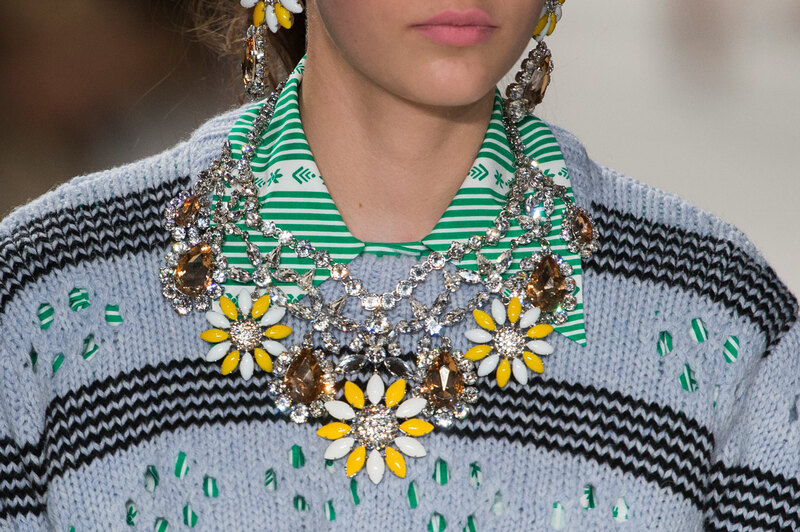 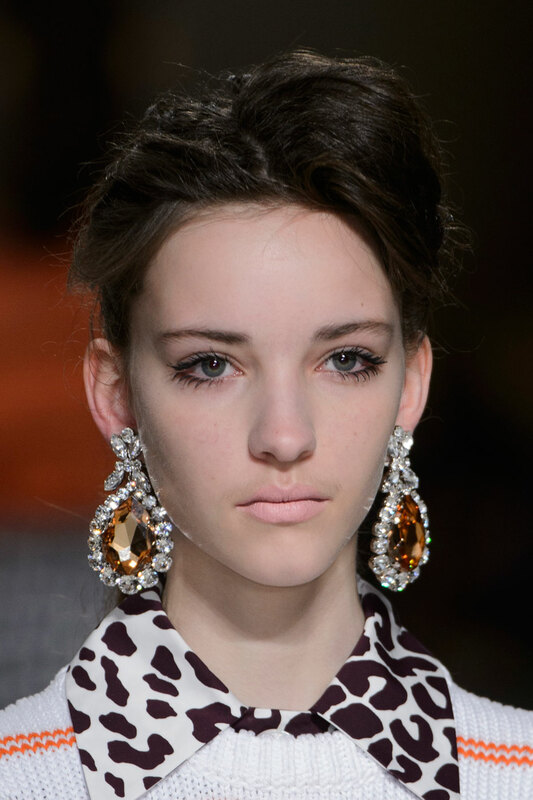 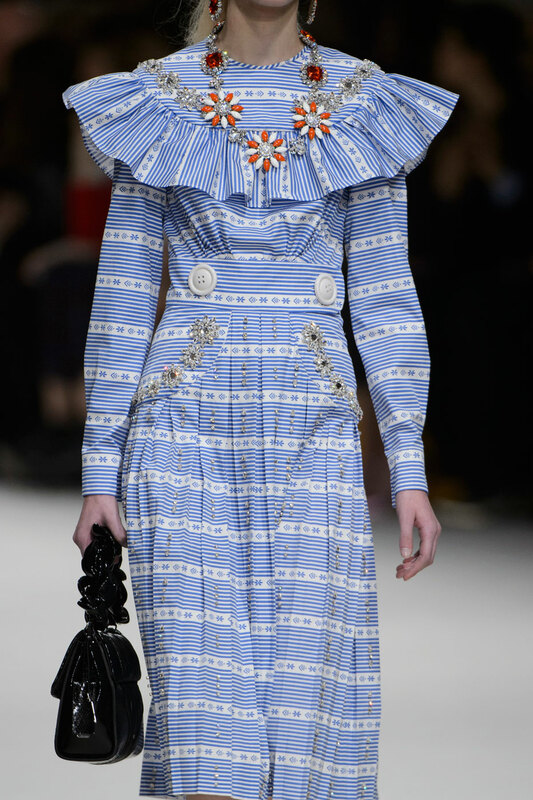 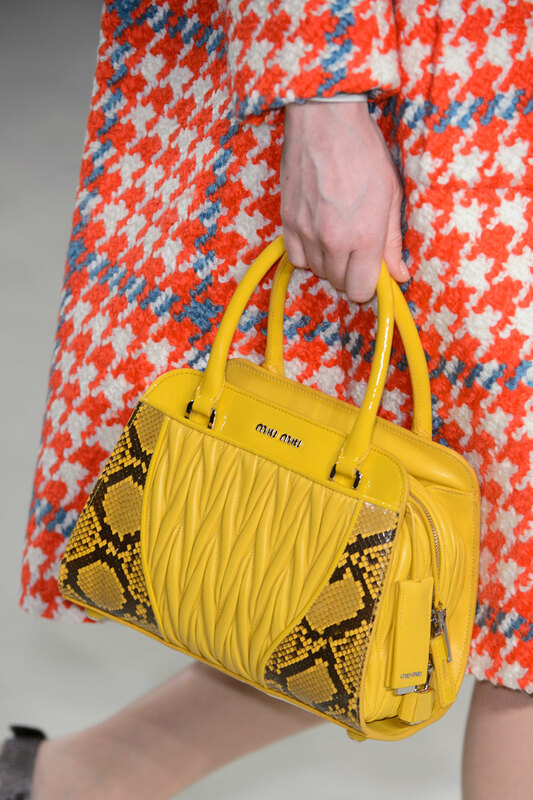 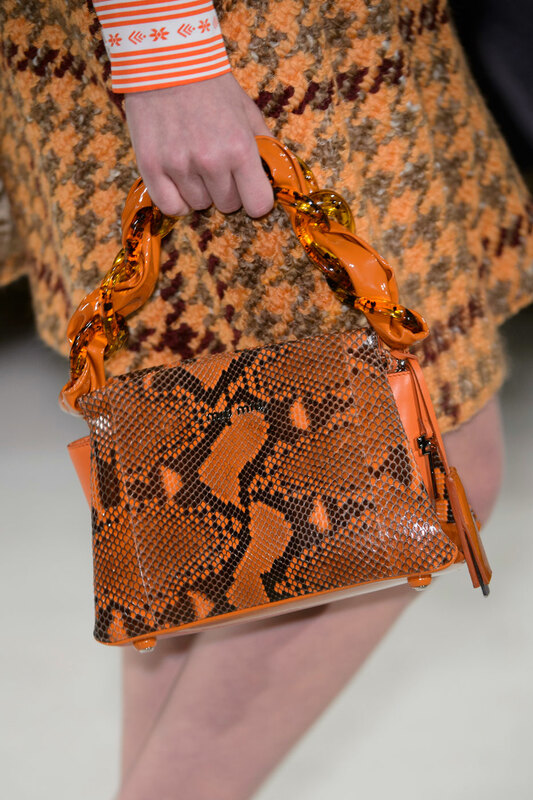 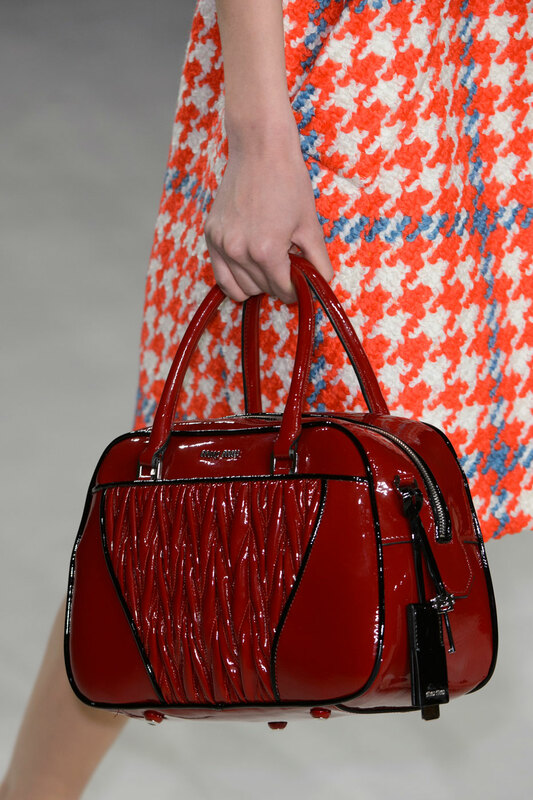 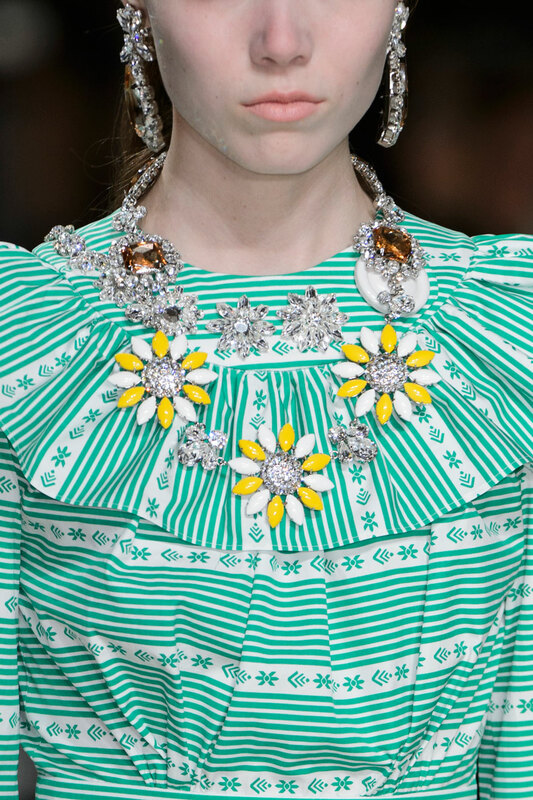 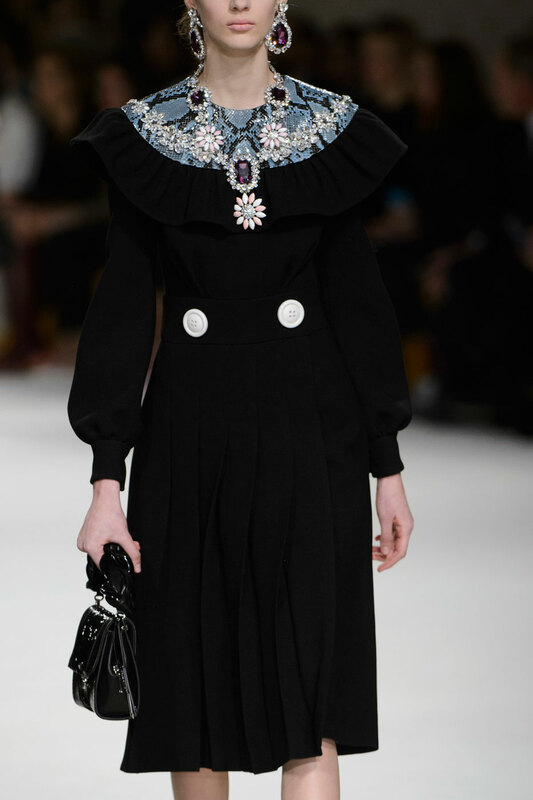 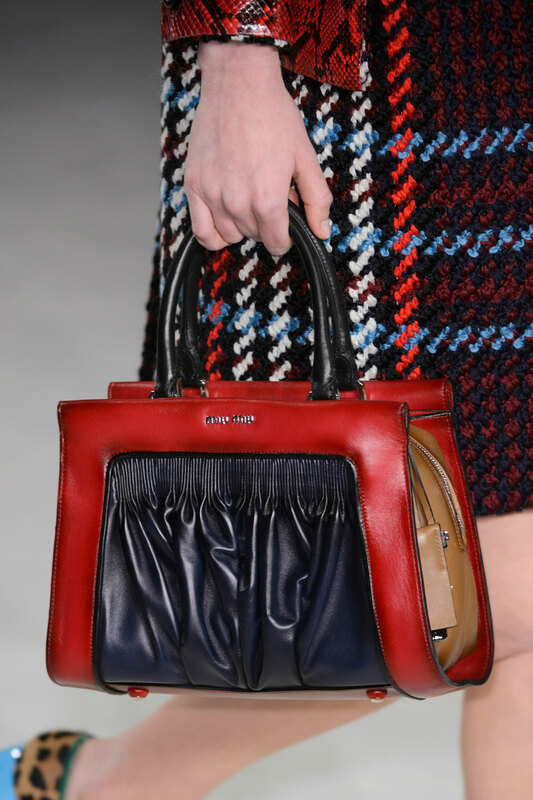 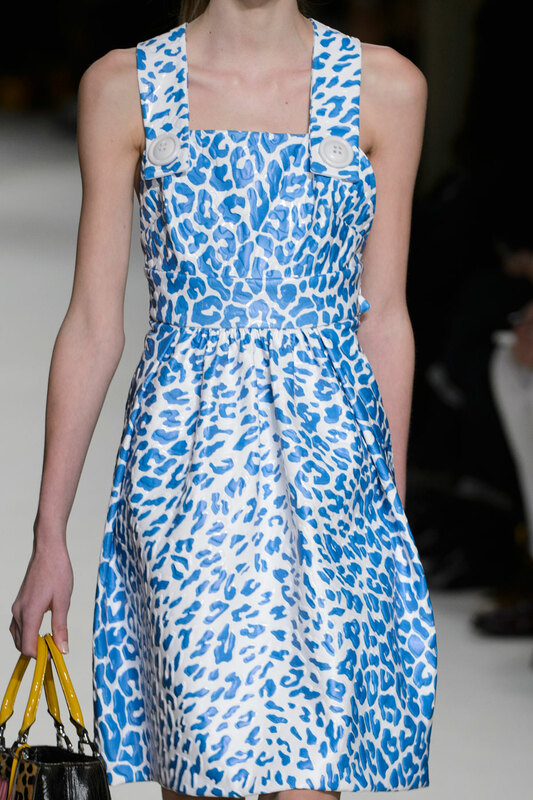 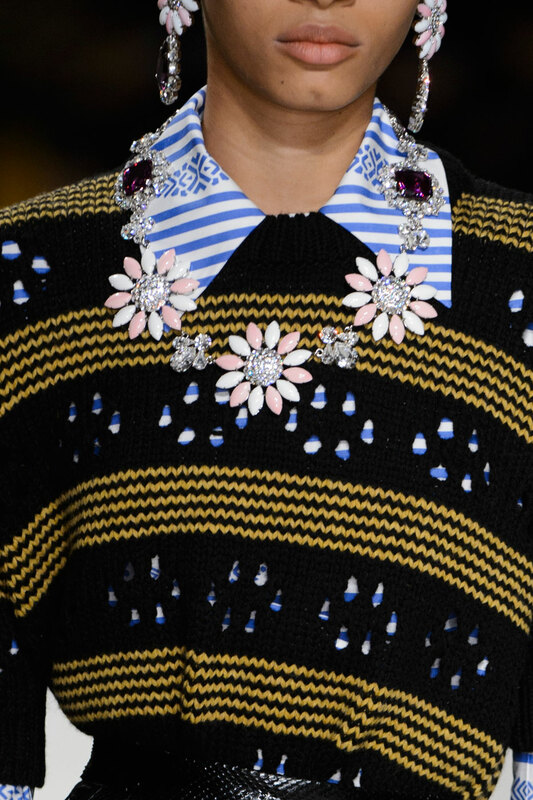 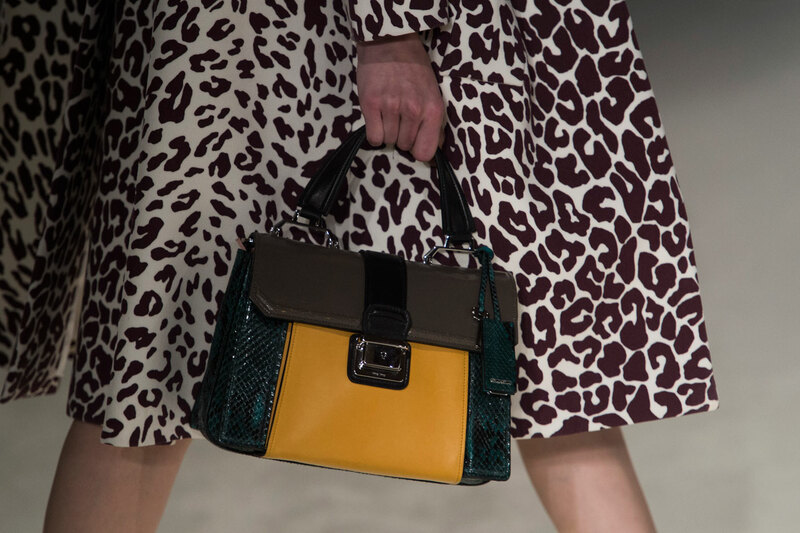 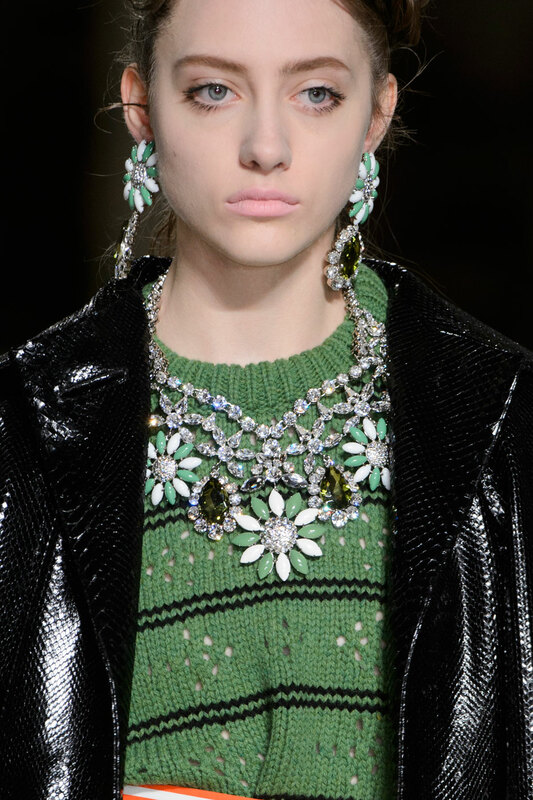 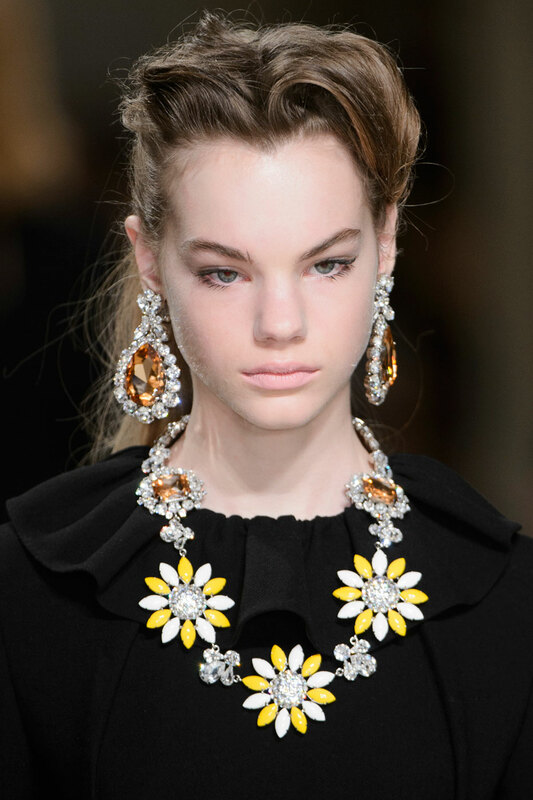 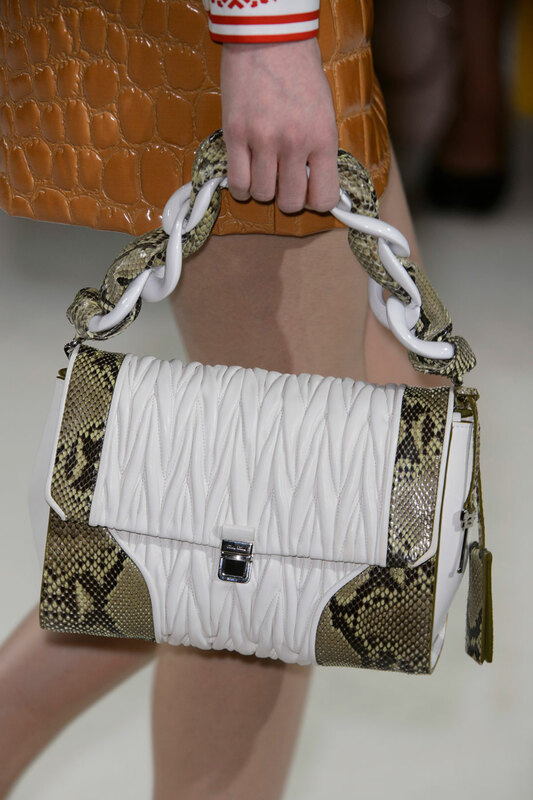 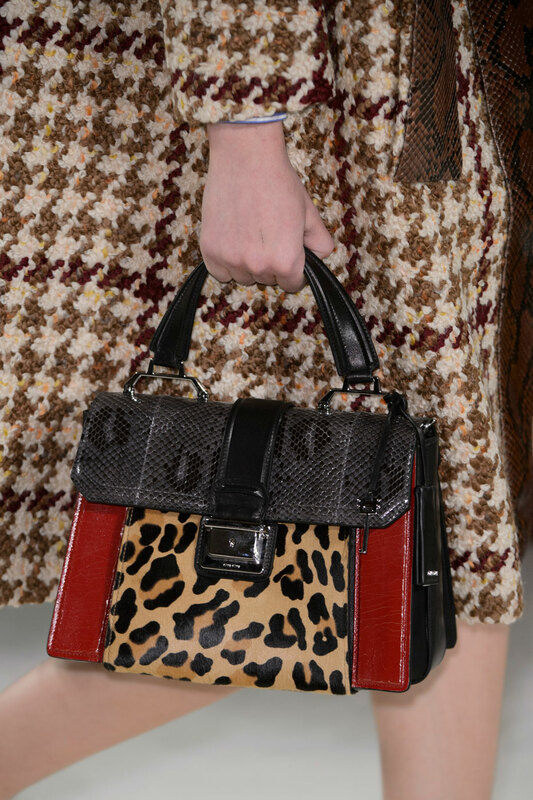 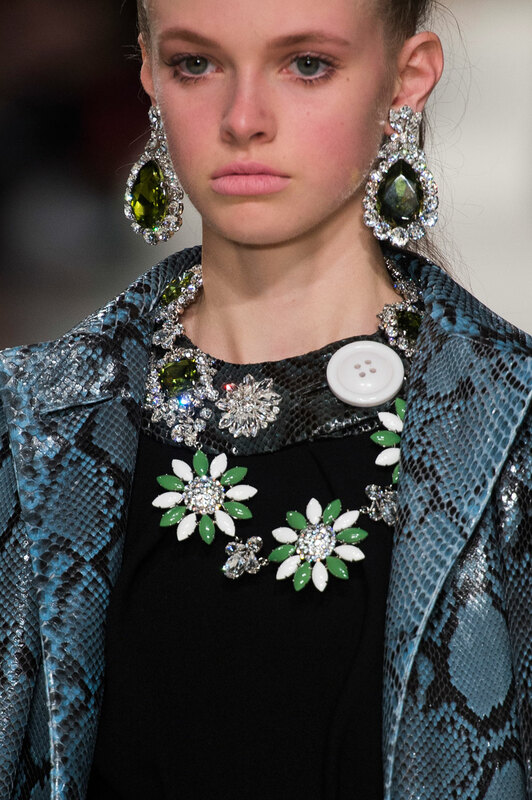 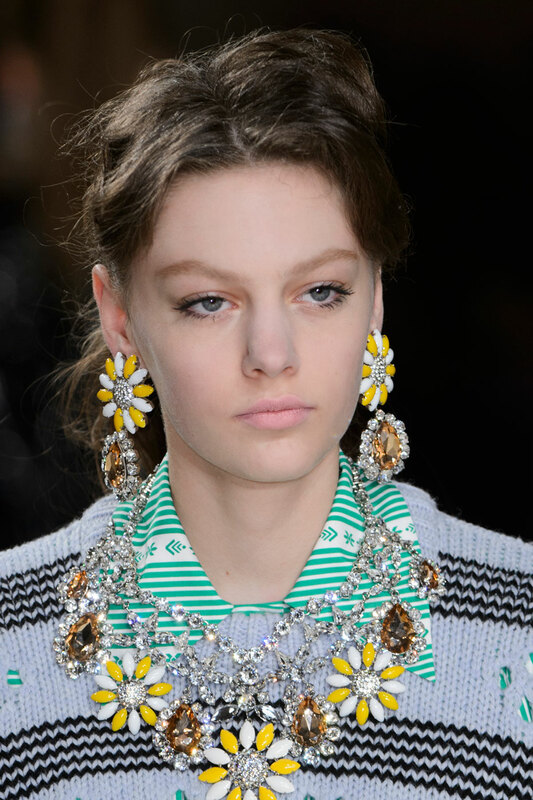 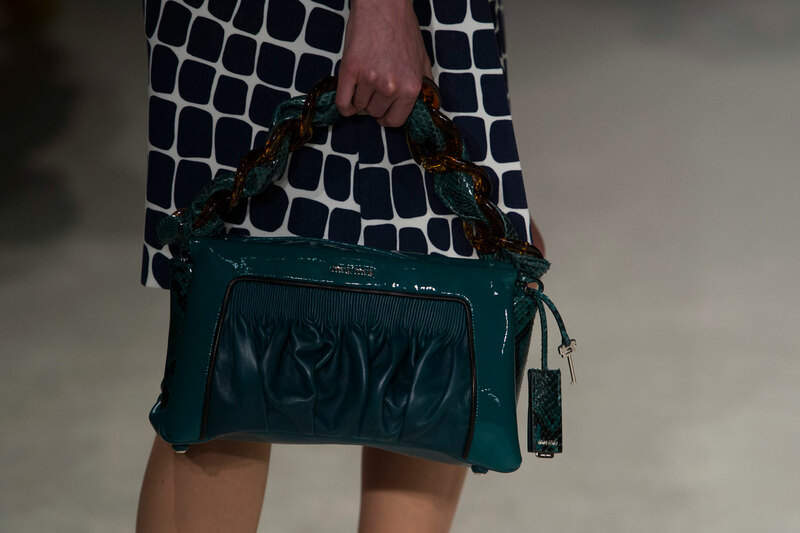 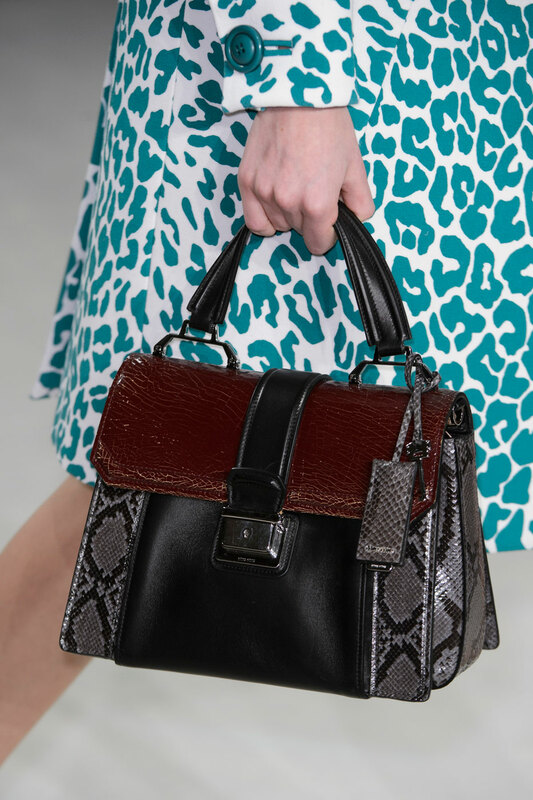 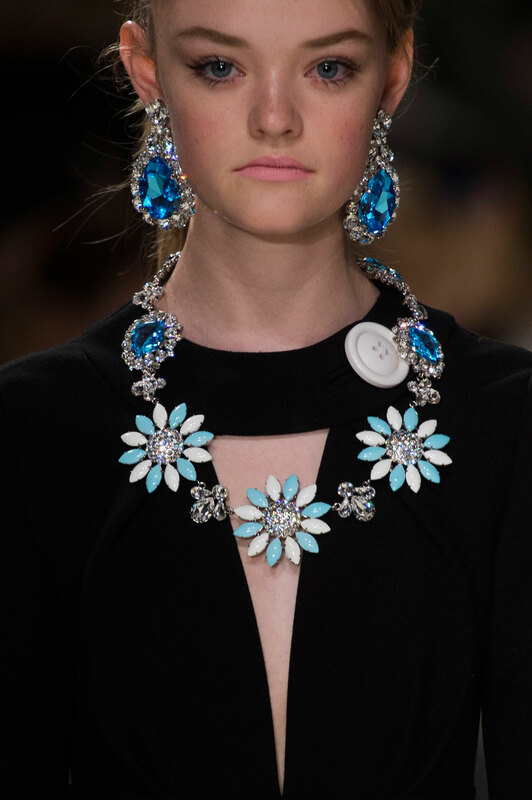 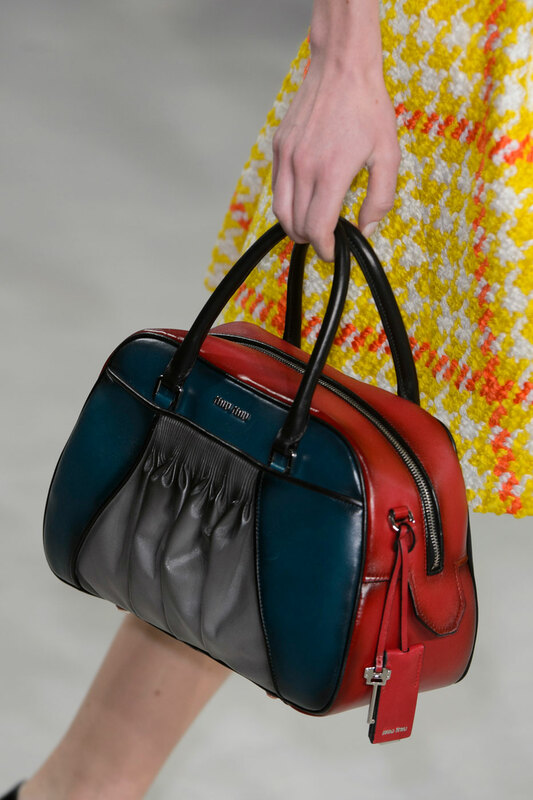 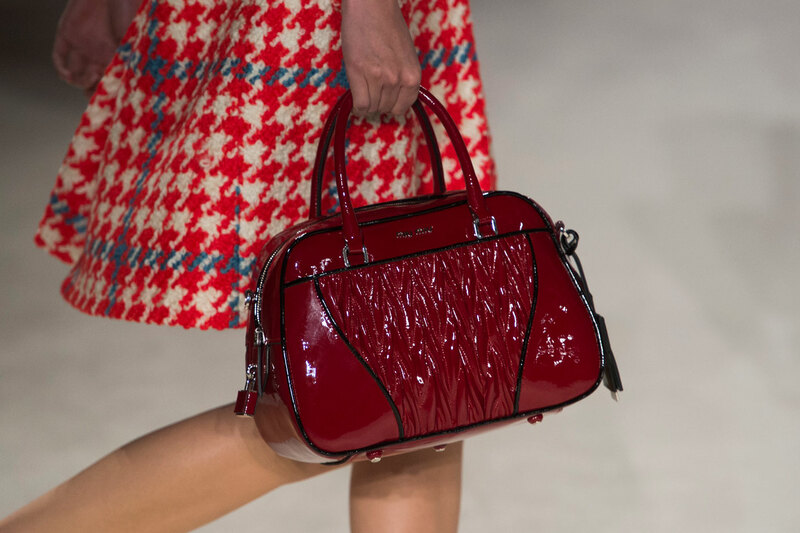 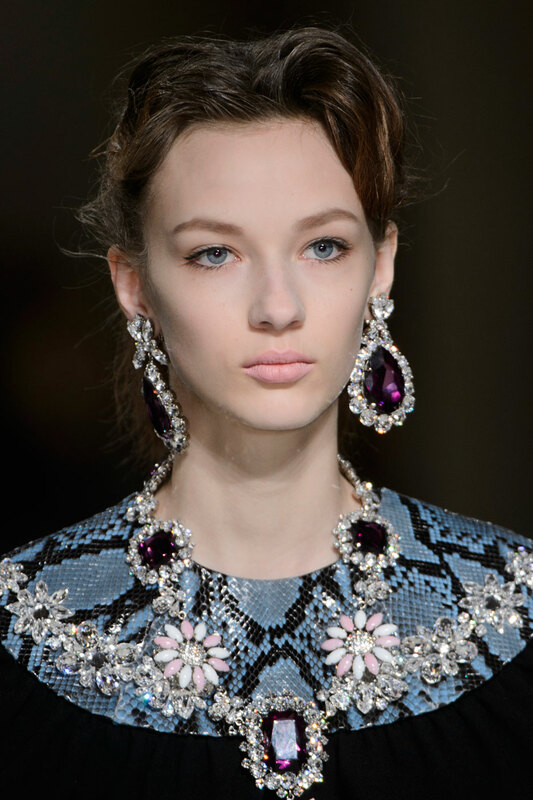 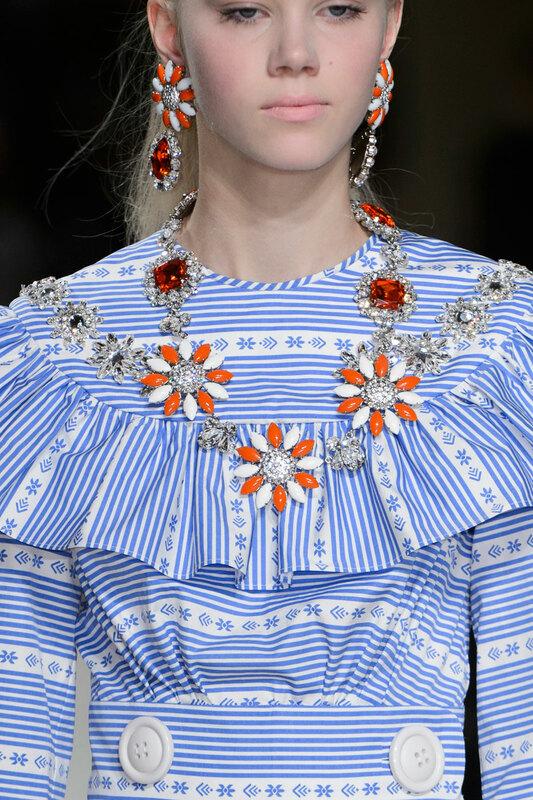 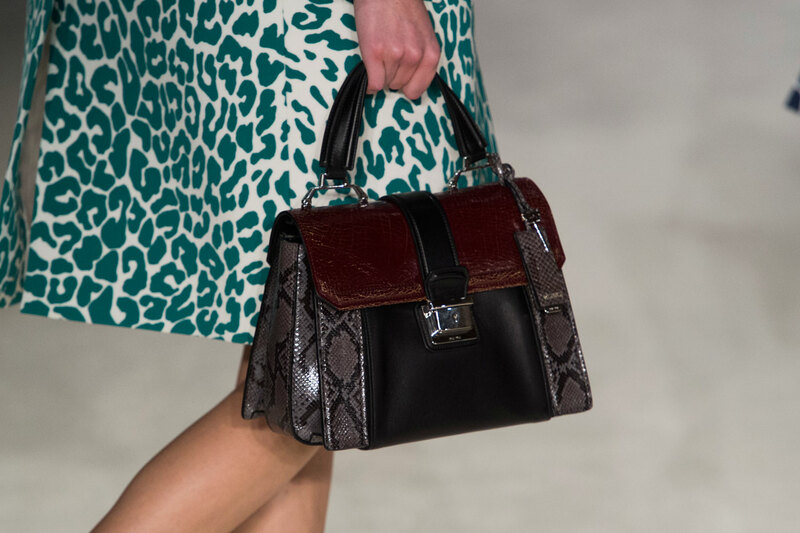 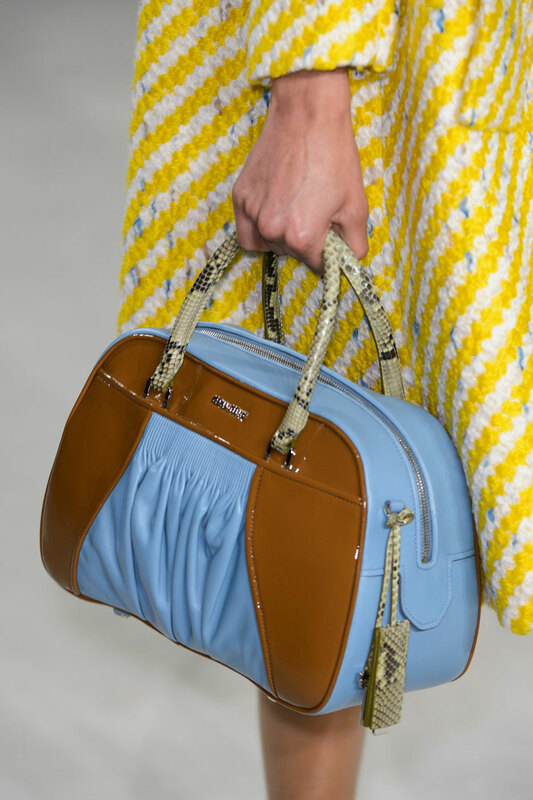 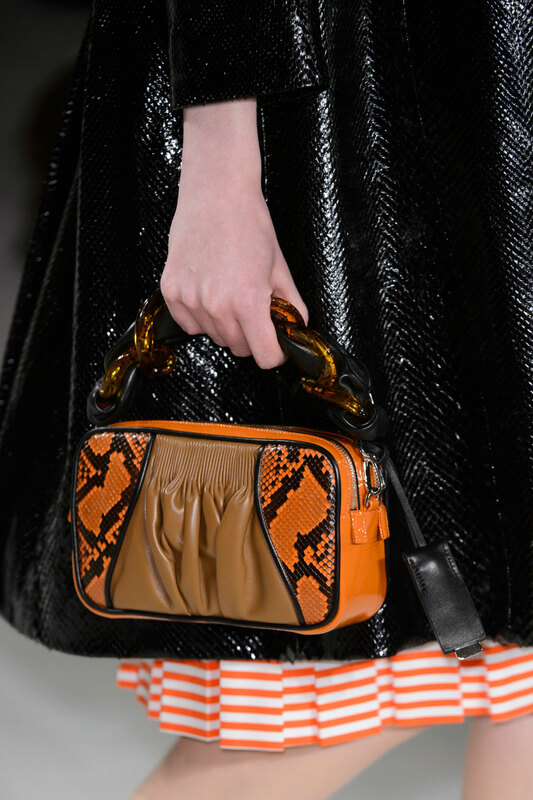 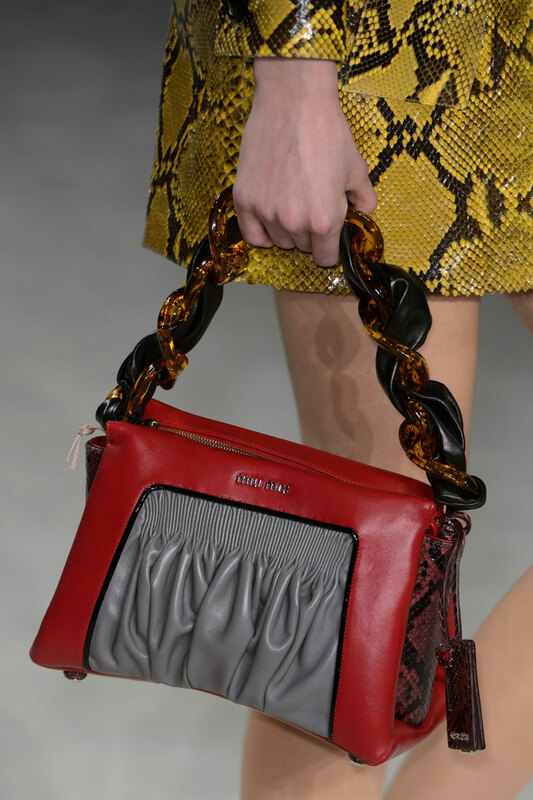 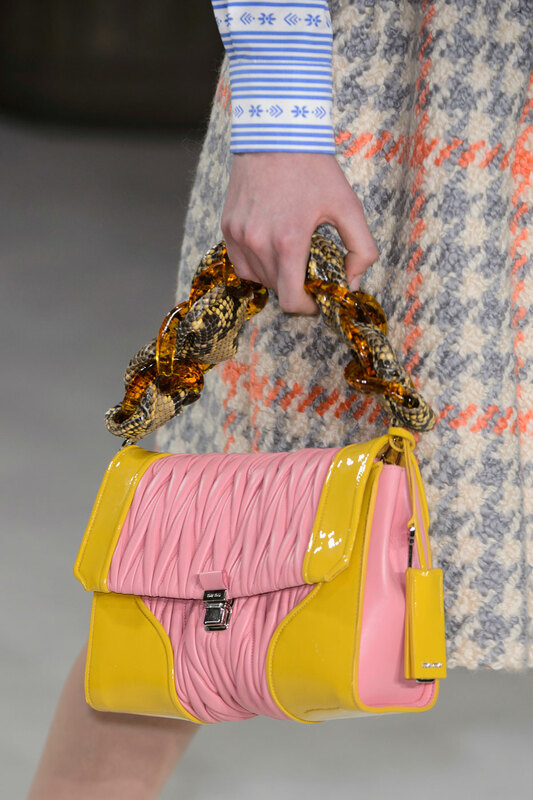 Looks were accessorized with costume floral jewellery, ‘granny bags’ sharing the same colours and prints as the clothes. 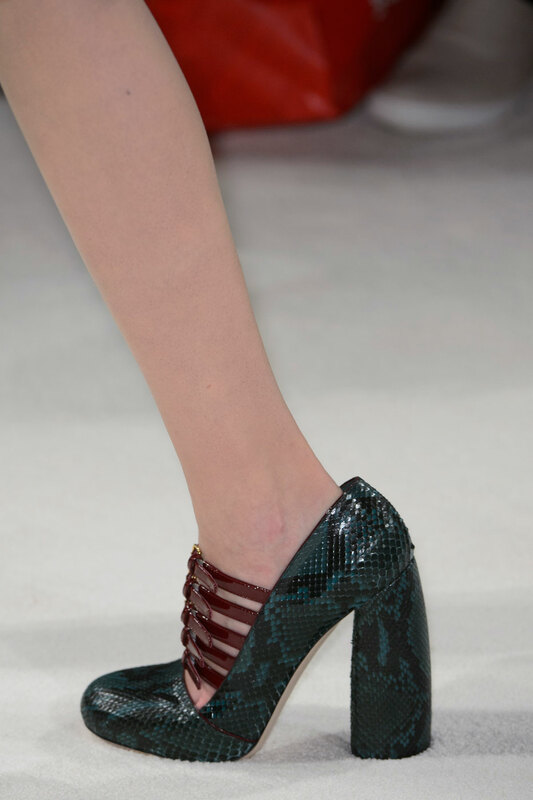 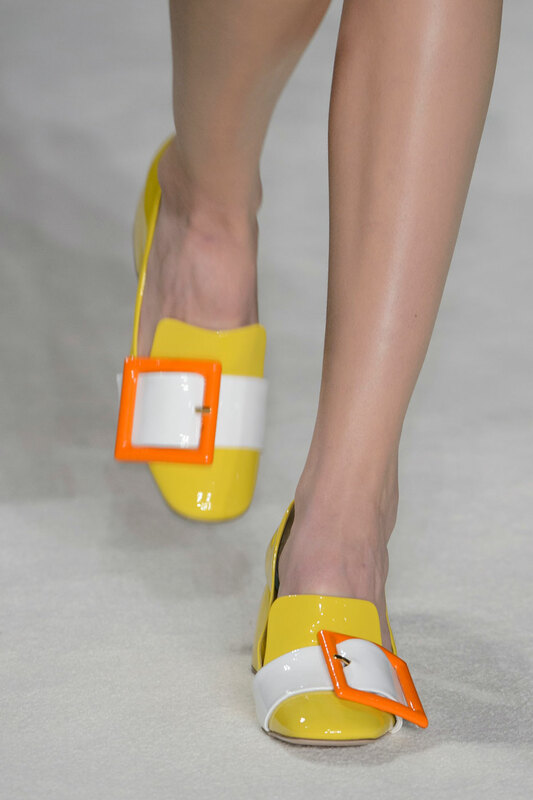 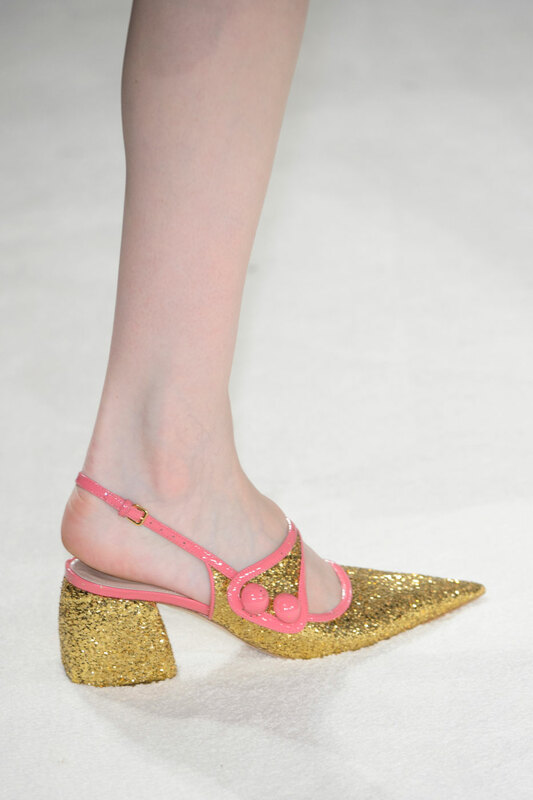 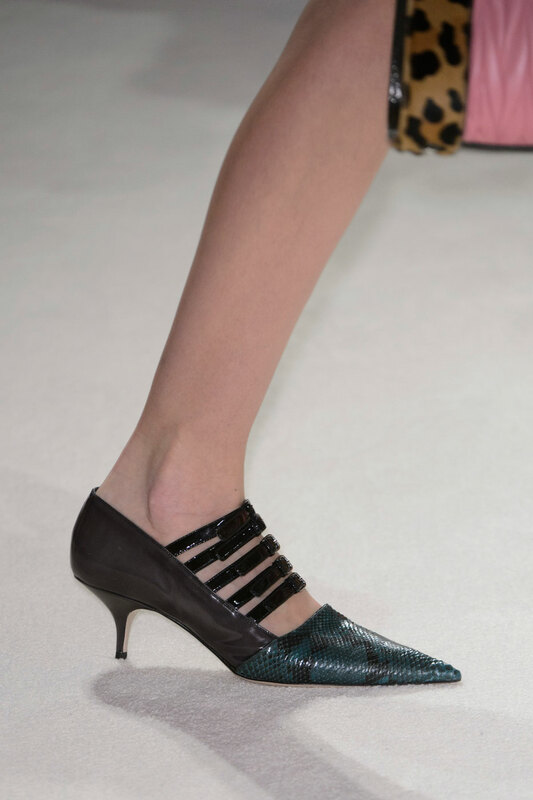 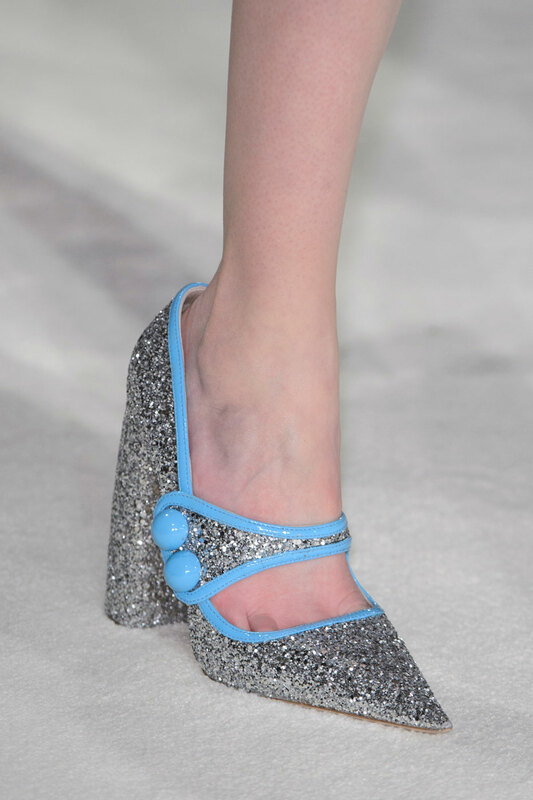 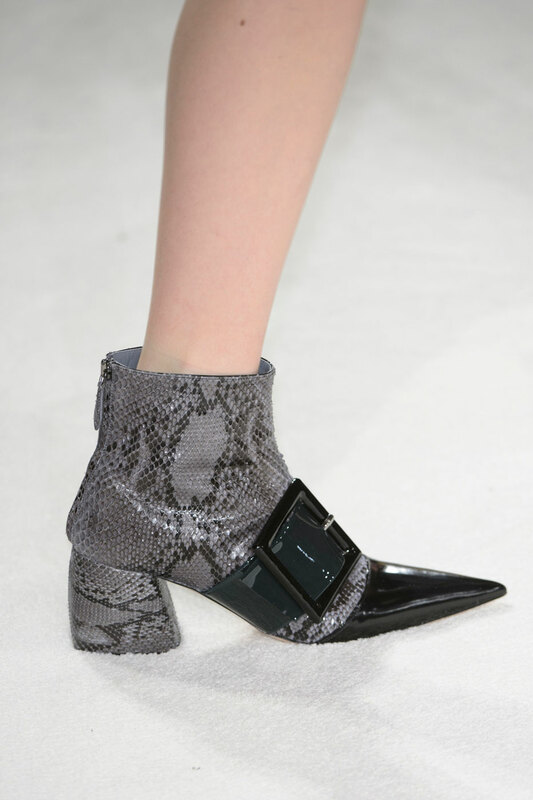 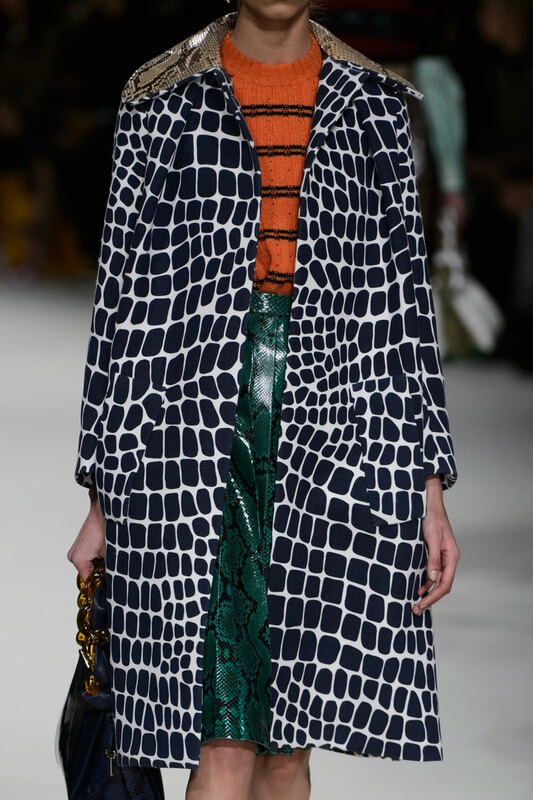 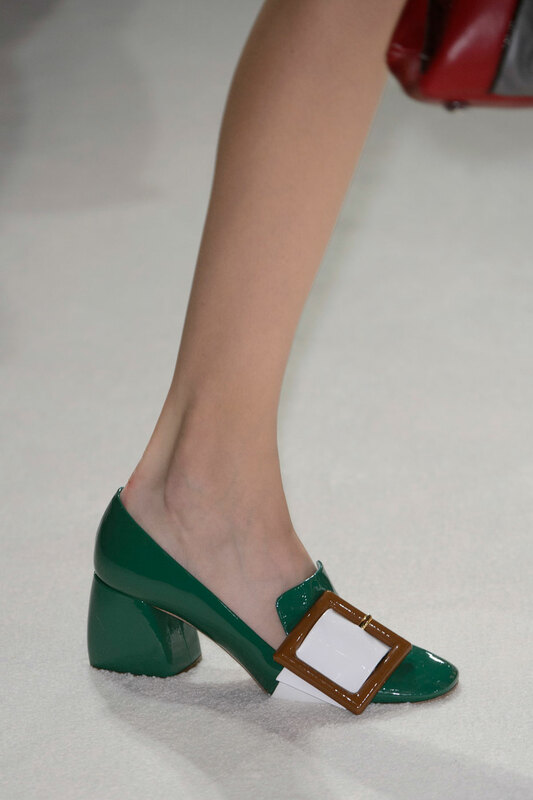 Models all wore different shoes which added a sense of quirkiness to the looks; square-heeled patent Mary Janes with oversized buckles, strappy python kitten heels, sling backs, open toed heels, all in psychedelic colour combinations. 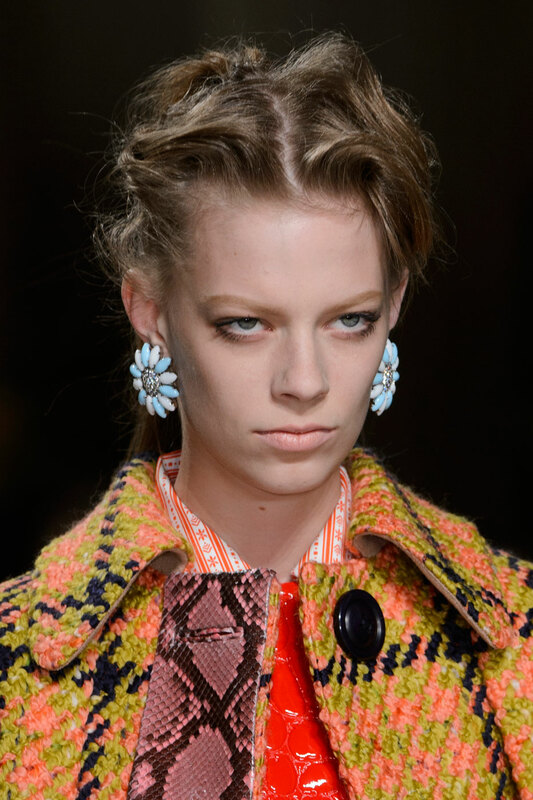 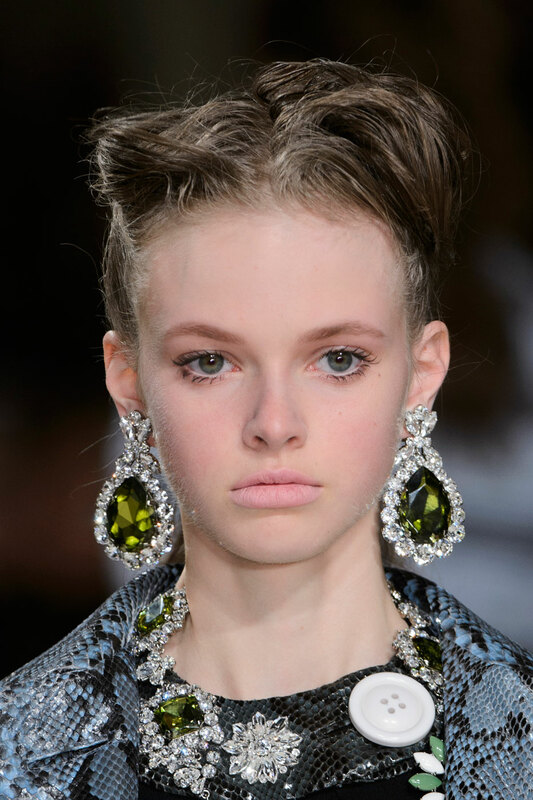 Hair was worn in a messy ponytail with a natural face, keeping the focus on the outfits. 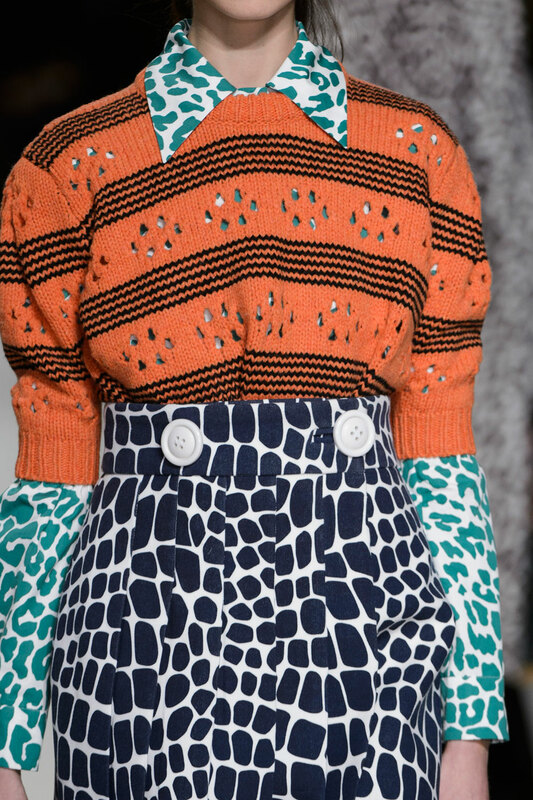 A colourful carnival of the animals made for a very wacky season’s finale.